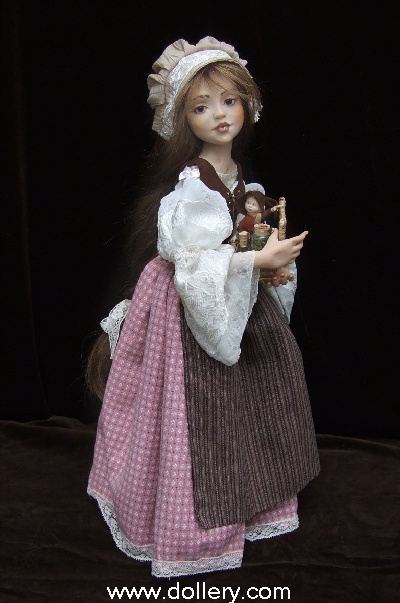 Silke Schloesser at our 2007 Doll Show! 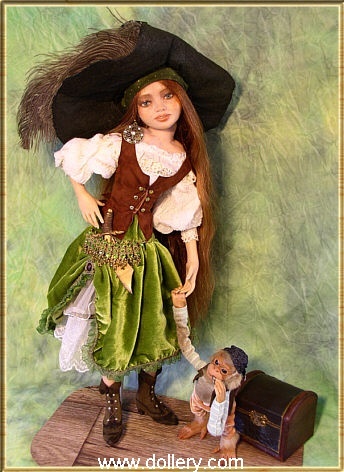 2012 update - We have just posted a new little witch that Silke created especially for one of our preferred collectors. 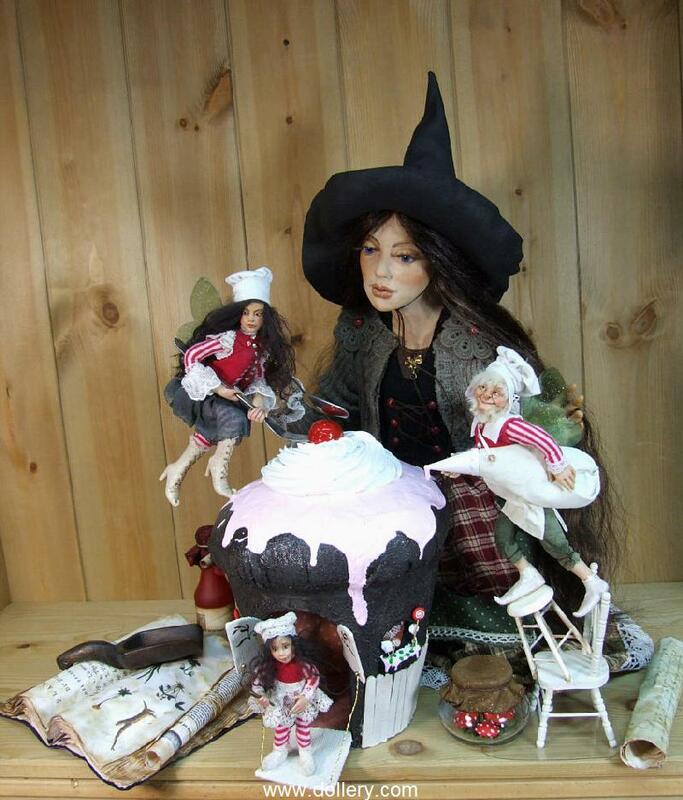 Her witches have been a big hit in recent years. 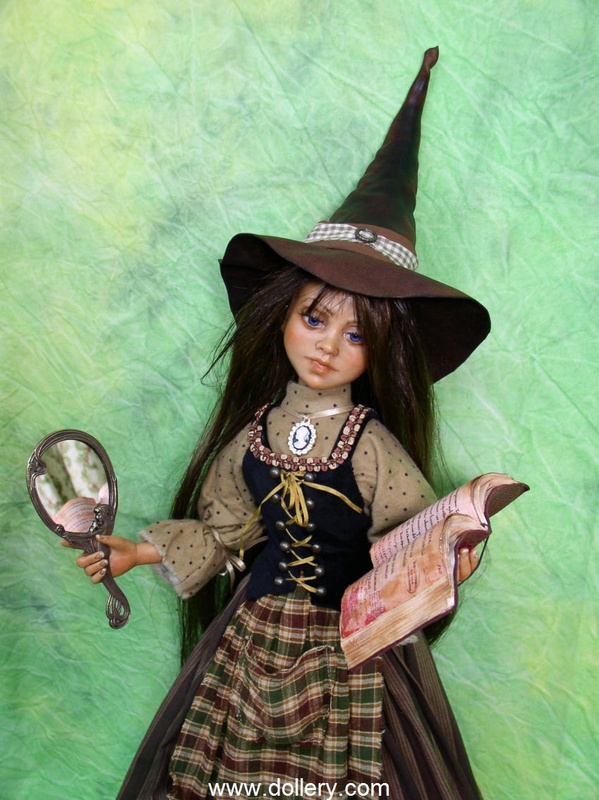 Be sure to inquire on custom witch orders and don't miss our "Home Sweet Home" unique one of a kind witch currently available! 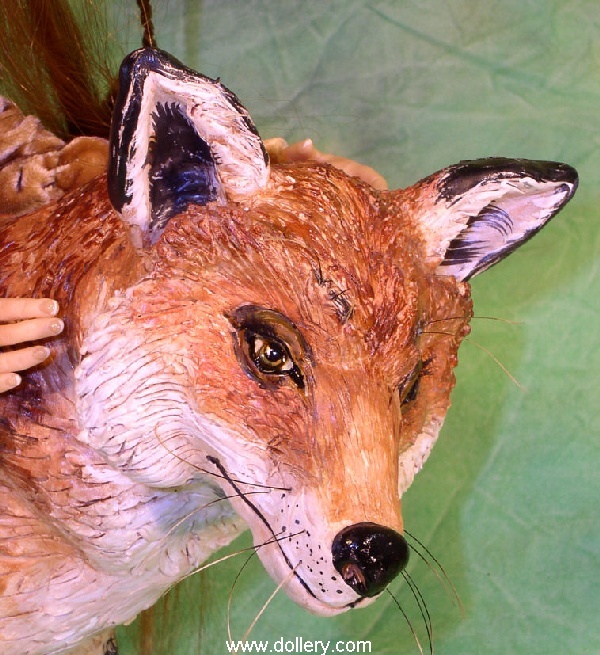 This past October we were honored once again to have Silke's amazing work in our show. 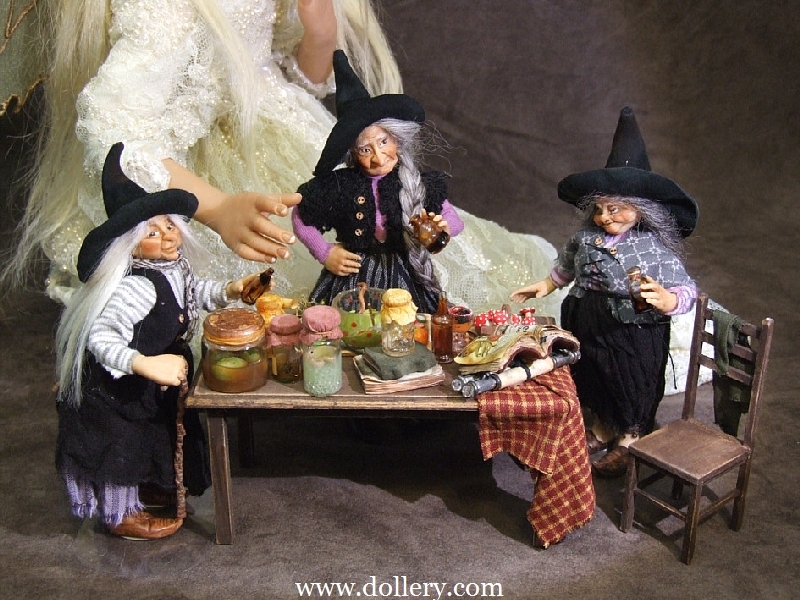 Silke introduced her witches a couple year's ago and they just took off! 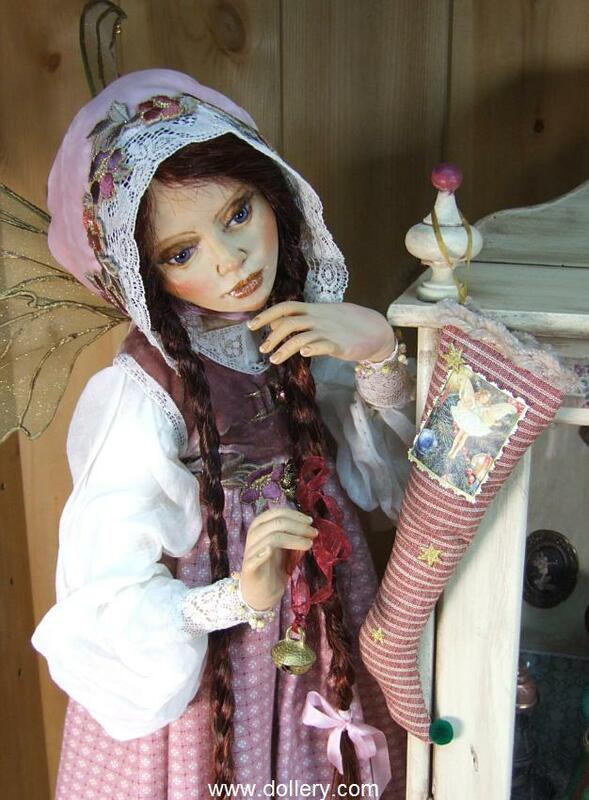 In addition to her witches Silke creates beautiful Story book dolls (See Snow white and the dwarves and Cinderella) as well as many magical fantasy fairies, trolls and other characters. She is talented beyond belief! 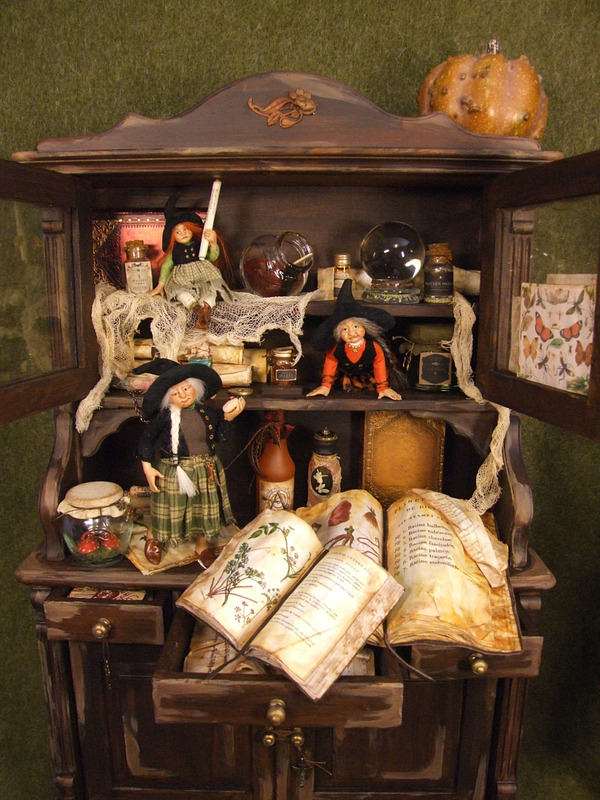 We are still awaiting another wonderful new witch cabinet filled with witch goodies and her little witch helpers coming end of April! Be sure to contact us if you are interested in custom special order pieces! 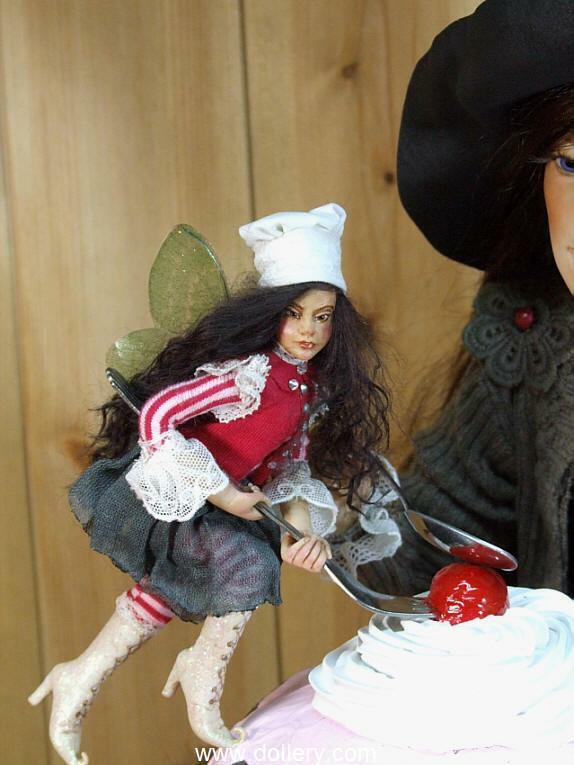 We are constantly taking orders for similar creations to the one of a kinds she has done previously. 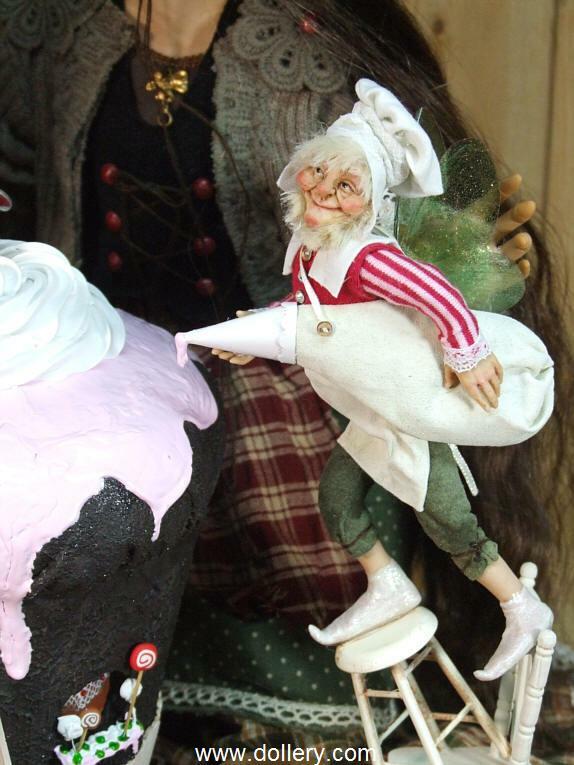 Silke is very careful though to maintain the nature of her one of a kind work and no two will ever be exact. That said, if she is inspired to do the creation you can rest assured it will be fantastic. 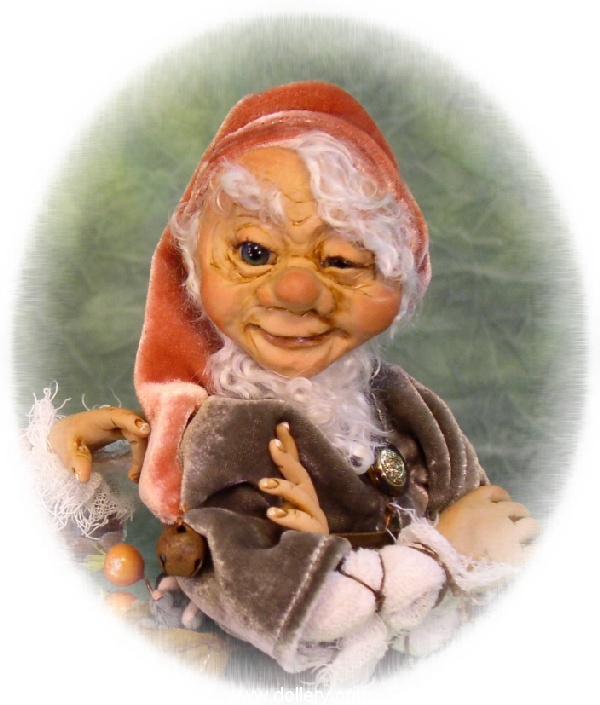 Looking for trolls? 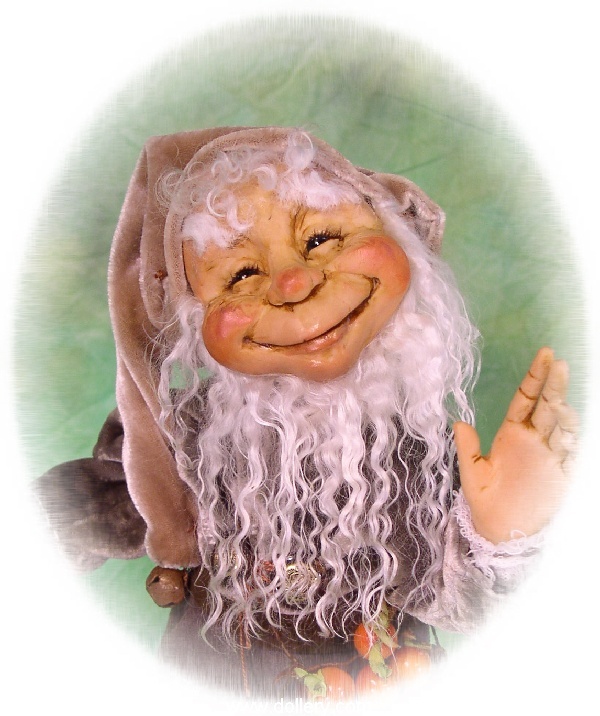 Silke's imagination is endless and her amazing little troll friends are hard to keep in stock! 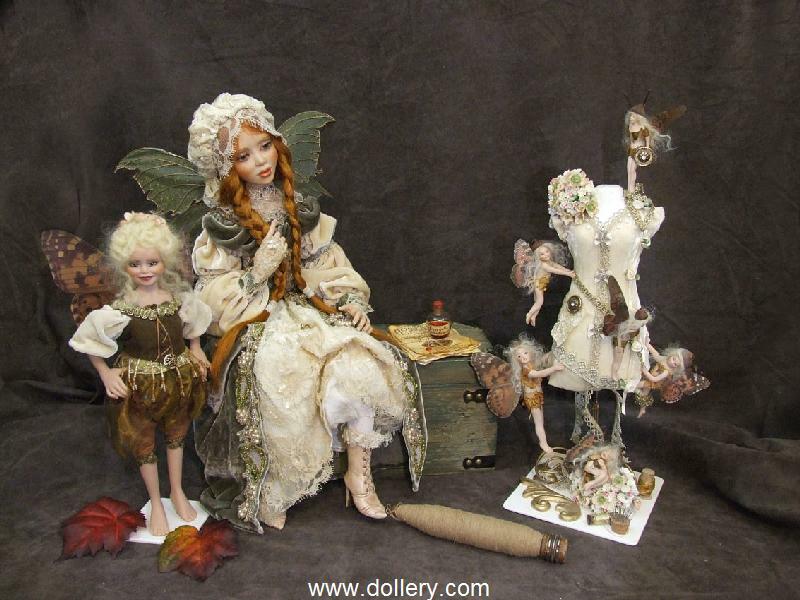 Email kmalone@dollery.com to view available trolls NOT SHOWN HERE! 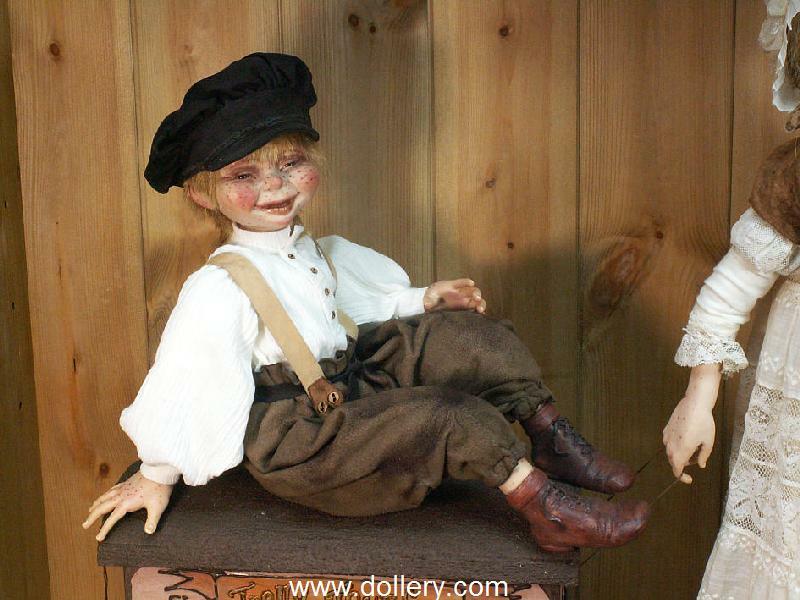 Love a doll already sold? 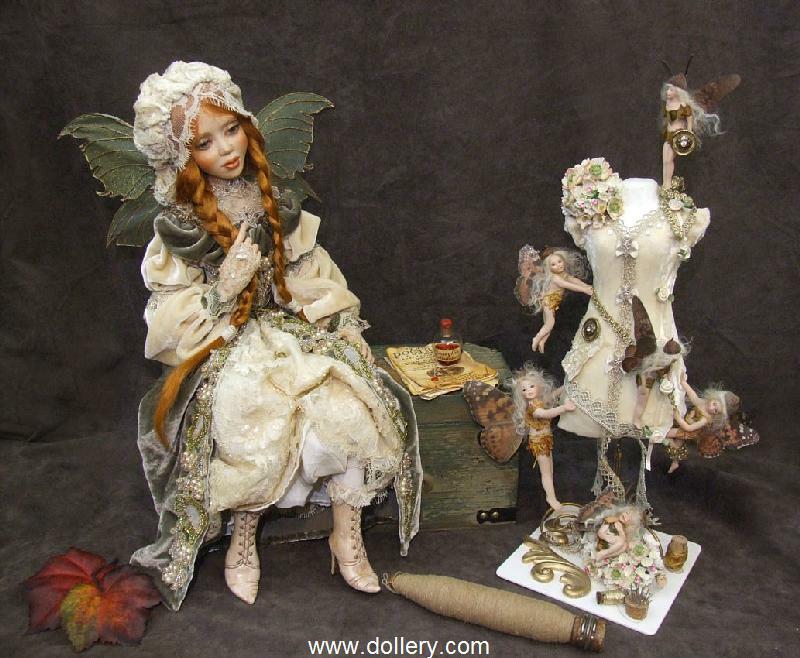 Contact kmalone@dollery.com about custom orders for Silke's amazing work. Each is a true one of a kind but similar themes can be requested. Of course Silke is always very careful to protect the one of a kind nature of the piece but similar colors, feels and faces can be requested. Contact kmalone@dollery.com for more options. 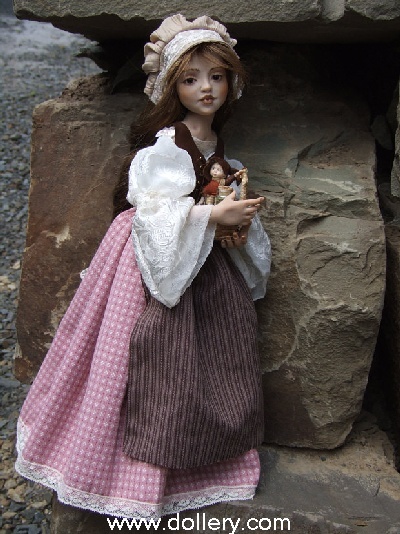 To order email kmalone@dollery.com or you may also call 800-447-Doll ext 15 out of state or 781-447-6677 ext 15 in state Ma. for further information on Silke and her fantastic work. 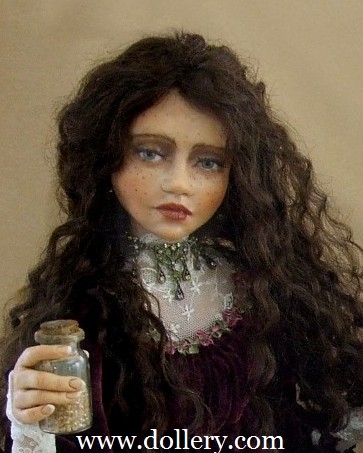 All her dolls are made from Polymer Clay. 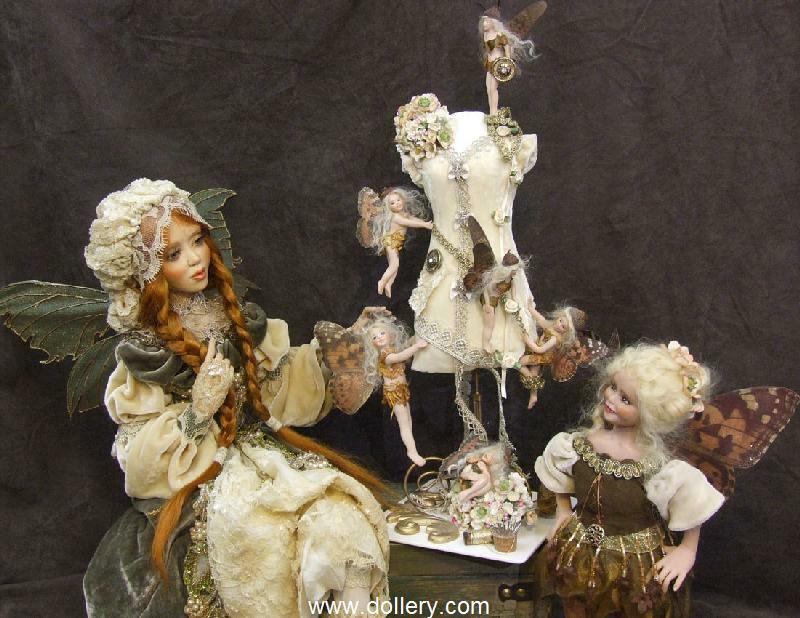 Email kmalone@dollery.com for a full color Doll Show catalogue highlighting Silke's work and 40 other world renowned artists. 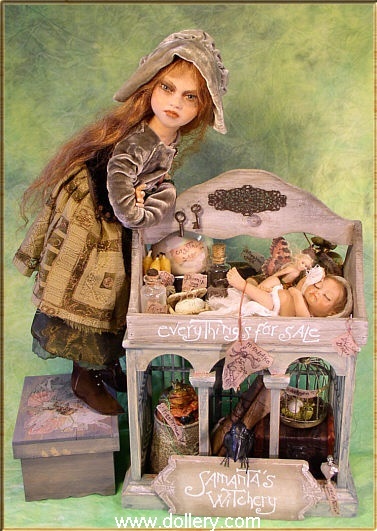 “Home Sweet Home” $5,300.00 (Set only) - SOLD! 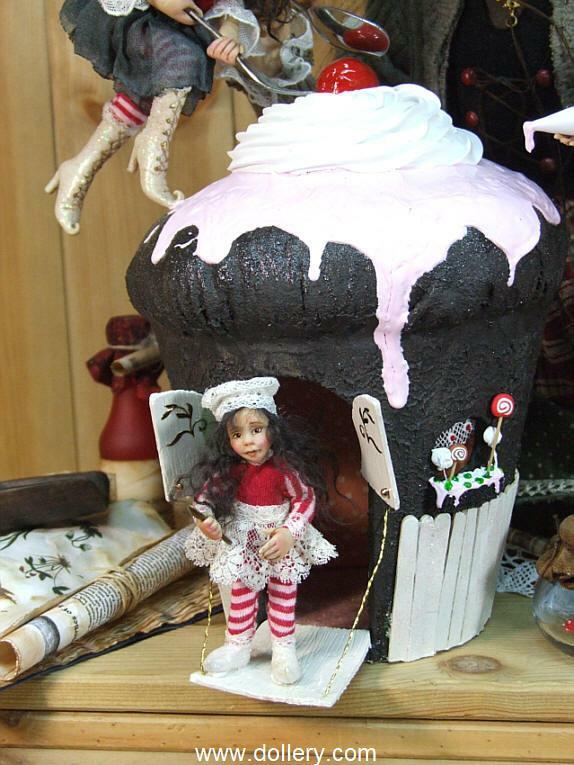 We just love this “Home Sweet Home” piece. 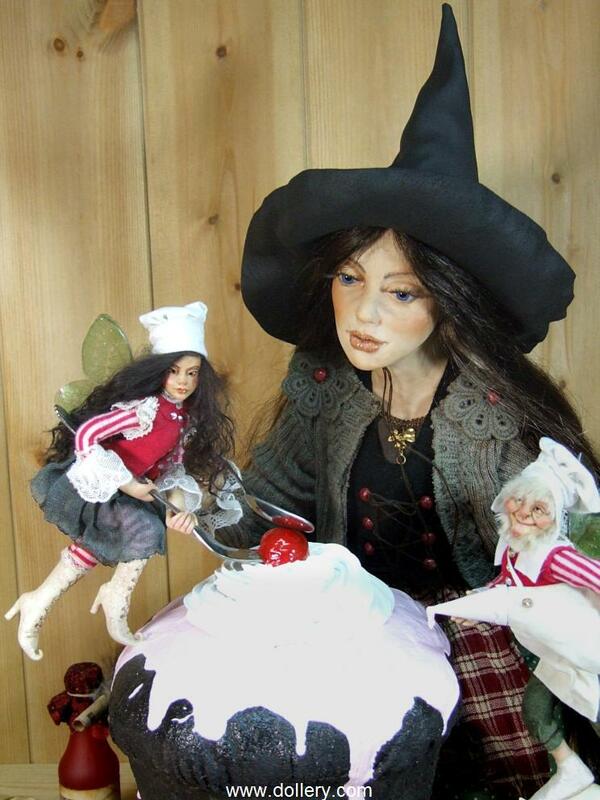 The big witch is helping the little fairies to build their very own home! 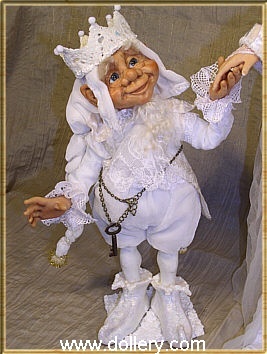 The big doll is on her knees. 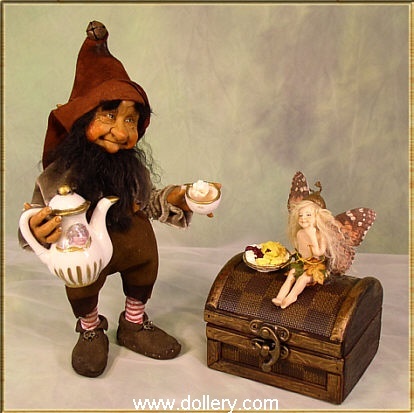 The big cupcake is made by Silke and the fairy to the left is fixed to the cupcake and not detachable The male fairy is fixed to the chair he is standing on and the fairy child can be detached. 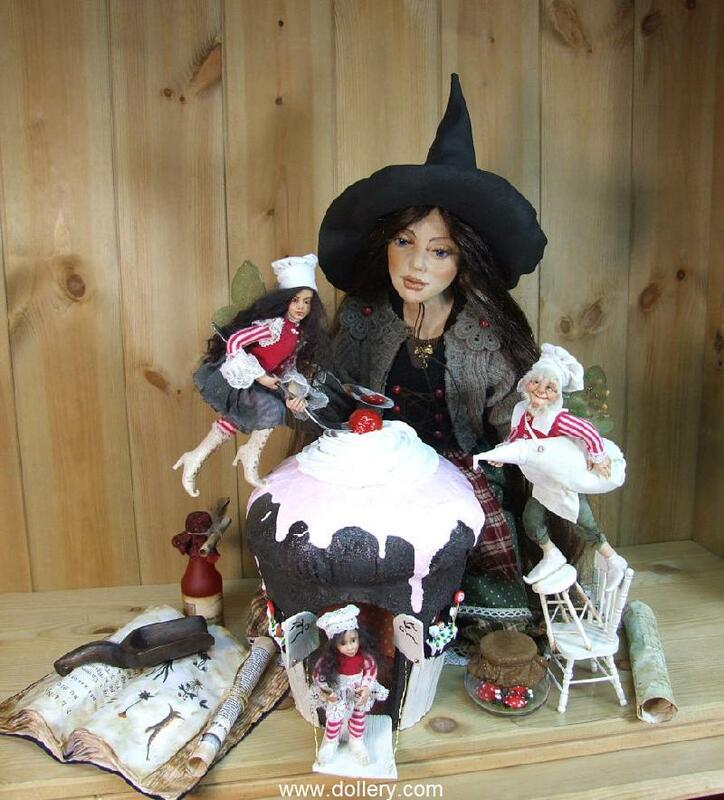 The whole set includes the big witch, female fairy, male fairy, fairy child, cupcake and all accessories shown including the vintage looking book, wooden spoon, red juicy bottle, glass with red toadstoles, and 2 script rolls made by Karin Caspar the famous miniature artist. This piece is exceptional. Don’t miss it! This piece tells a great story! 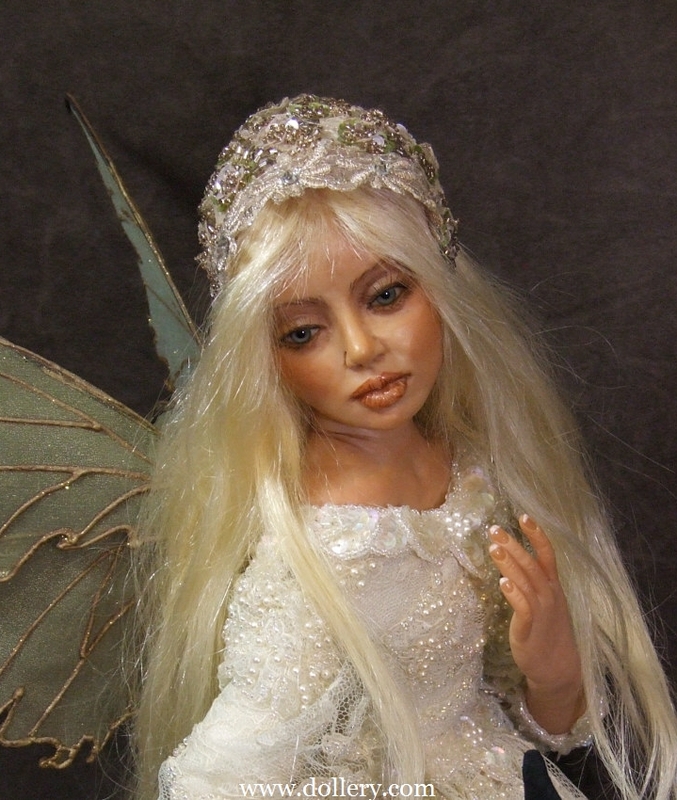 The fairy is completely posable and her wings are detachable. 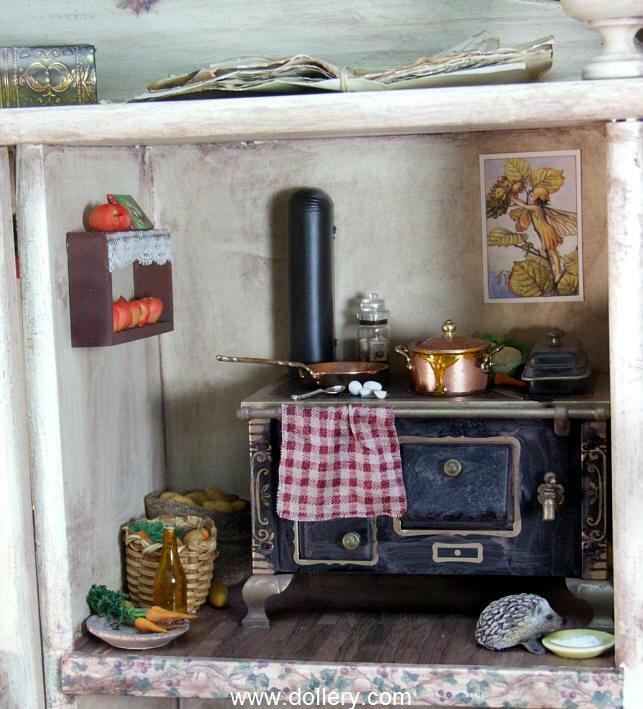 The cupboard is hand painted by Silke and includes three rooms filled with hand made miniatures in addition to the hand sculpted miniature dolls in 1/12th scale. 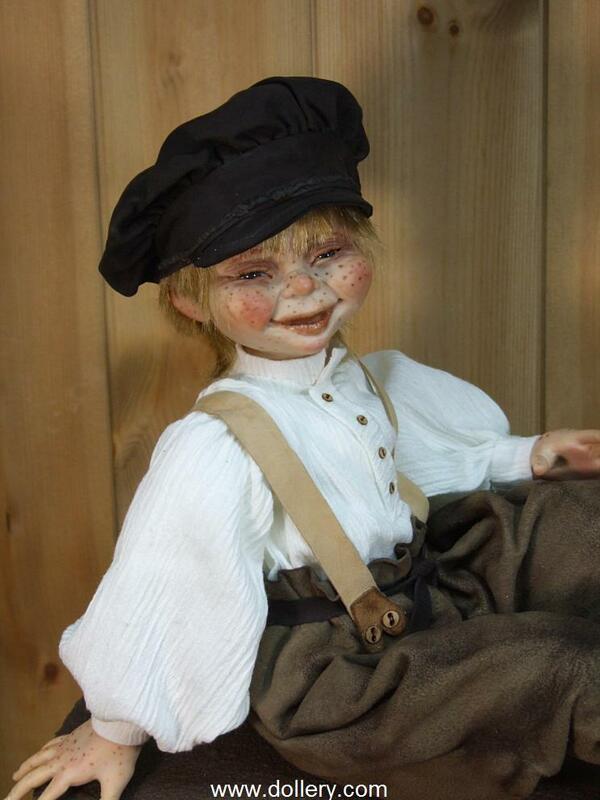 Most of the furniture is made in Germany out of wood, metal or leather. 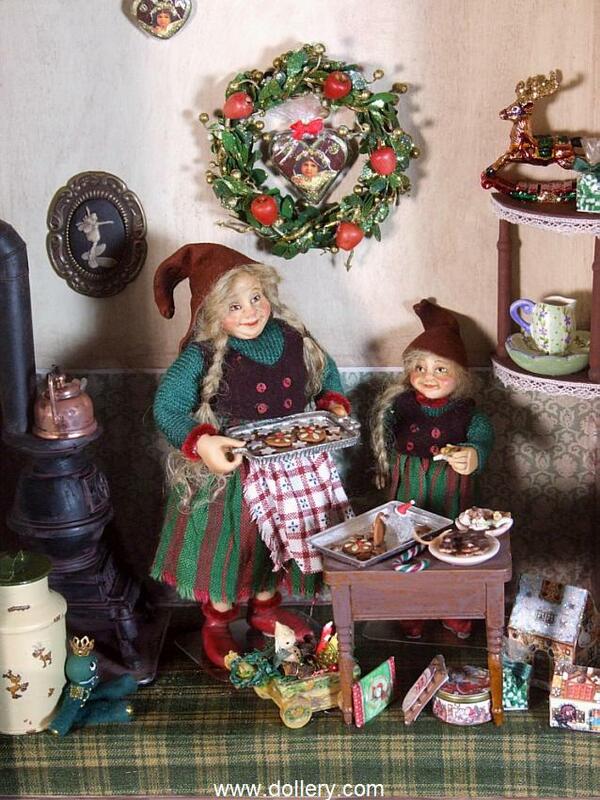 The set includes all shown accessories including food, books, a little mouse between the cookies, and gifts which are all handmade by several miniature artisans from around the world. All accessories are fixed accept for the dolls. The left cupboard door has real glass & the three drawers can be opened. A treasure! 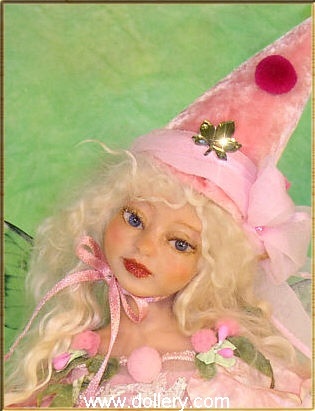 The “Fairy Diva” is dressed in silks and silk velvet and she drips with lace and brocade. Her boots are sculpted and painted. She has detachable wings. 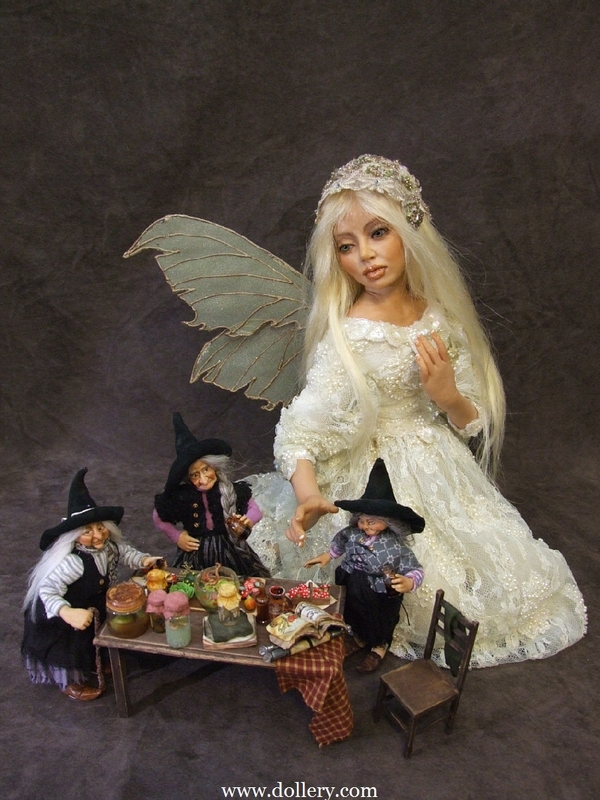 The six tiny fairies with her are fully sculpted in the 1/12th scale and range in size from 2.5” to 5” inches. 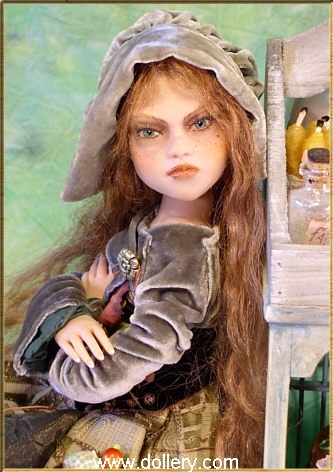 Each have mohair and painted eyes. The dresser bust is covered with silk velvet, lace, brocade and vintage paper flowers. The colors are cream or ecru. 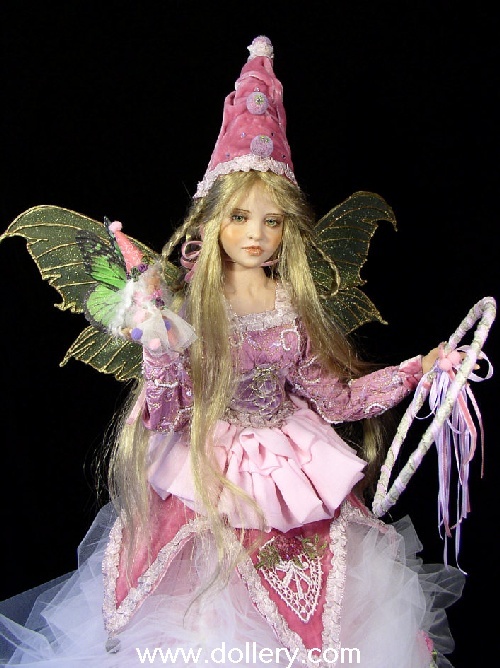 Not shown here, but available to add to this set, is a “Chief Fairy Apprentice” that is 13”and is shown in the image below. That piece is an additional $1,000.00. The set as shown above comes complete with all accessories. Love it! 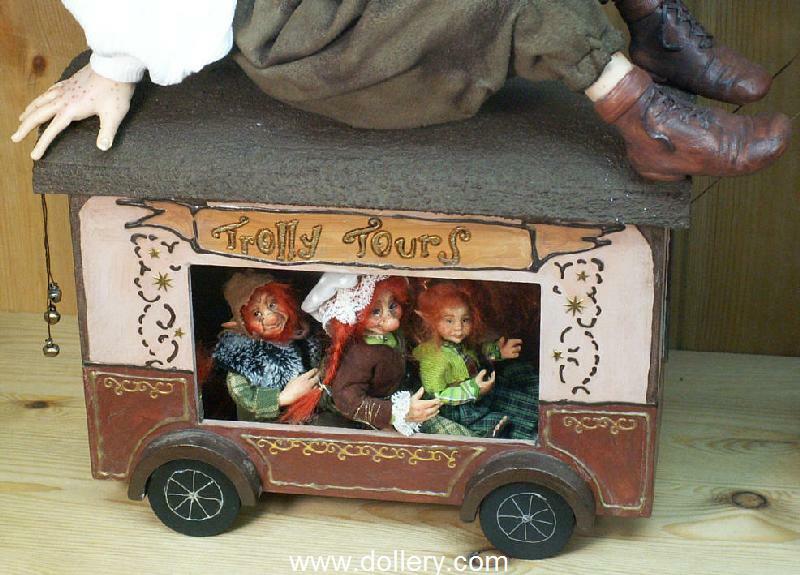 “Trolly Tours” comes complete with two fully poseable dolls and three miniature dolls handmade by Silke. 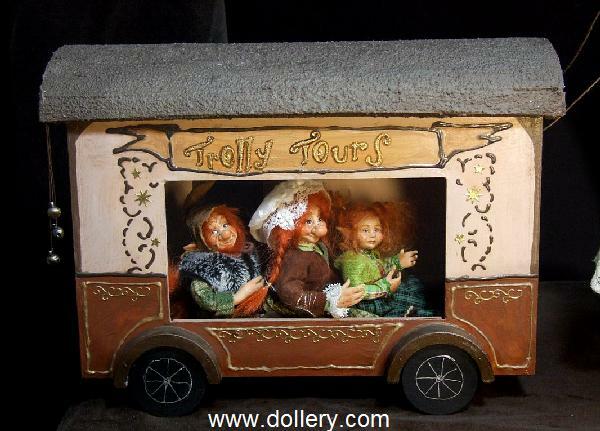 She purposely named it “Trolly” not “Trolley” because of the little troll companions. The large girl is dressed in a creme colored fine vintage cotton lace dress and a short cognac brown leather jacket. 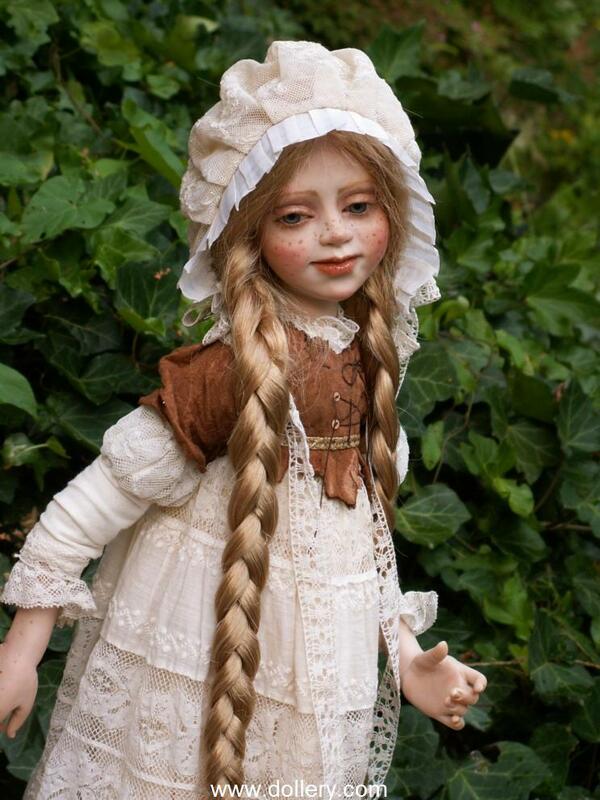 Her long blonde hair is human so the braids can be opened and the hair can be combed. Her little brother is dressed in fine leather and cotton. 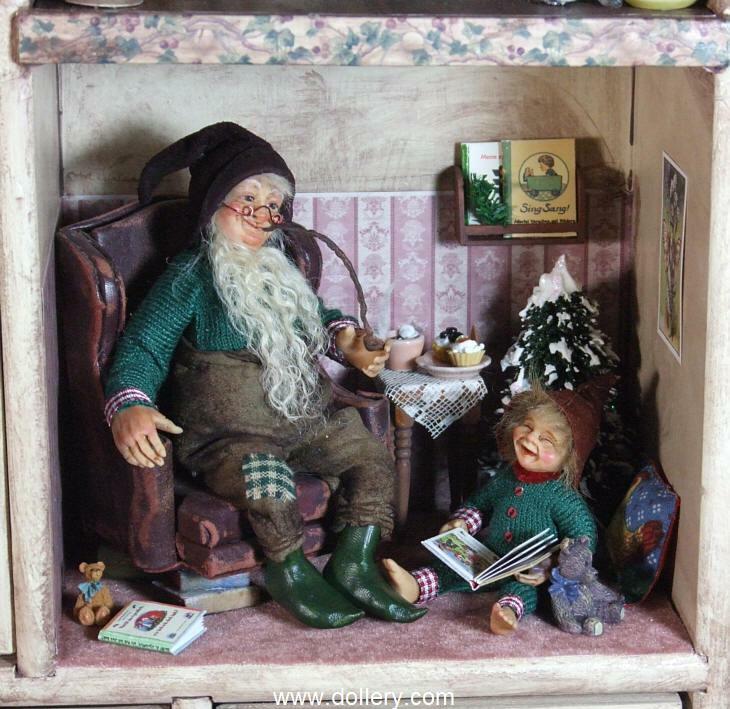 The set comes complete with this adorable trolley which measures 10” (w) X 8” (h) and inside is a miniature troll family sitting and enjoying the journey. They are posable too! See something you like but it is sold? Consider doing a Custom Order. Each is a one of a kind but similar themes or looks can be achieved. Different hair, eye and costume colors of your choice! 25% down and then you can either make monthly payments or pay the balance when the piece comes in. You can even request pieces to come in into 2011. 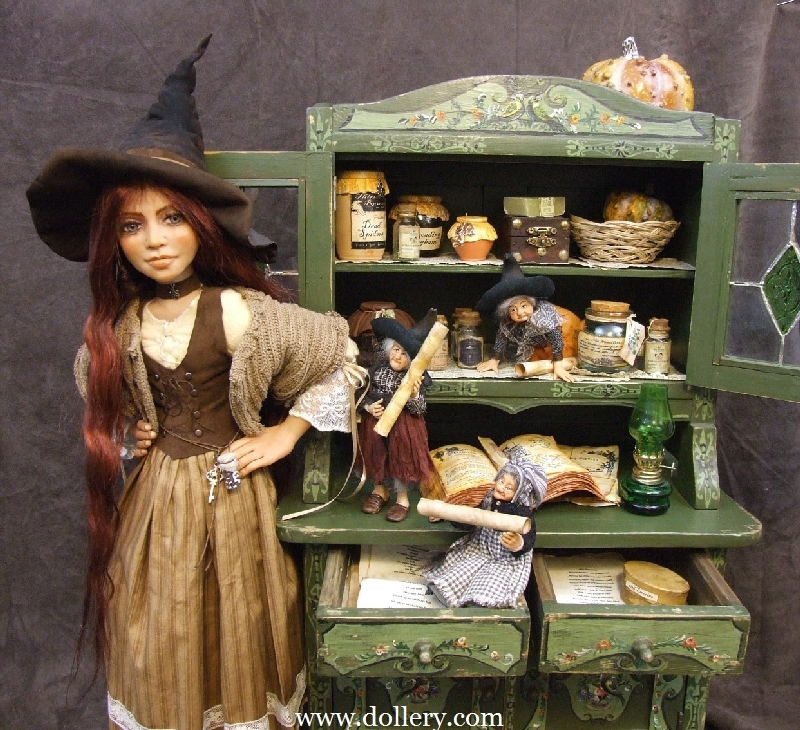 Witch w/Cabinet - $5,800.00 - SOLD - Contact kmalone@dollery.com for information about custom orders for other witches or to be put on our Silke mailing list for automatic updates on her work. The witches are a hit! 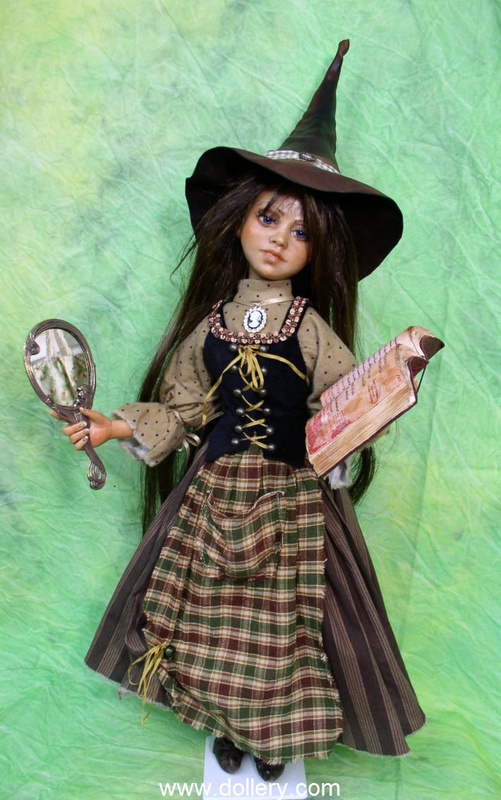 Be sure to contact kmalone@dollery.com or call asap if you are interested because we are taking custom orders for similar witch themes or other ideas you may have. Limited number of orders can be taken for 2011 so get your order in now for delivery dates that work for you. 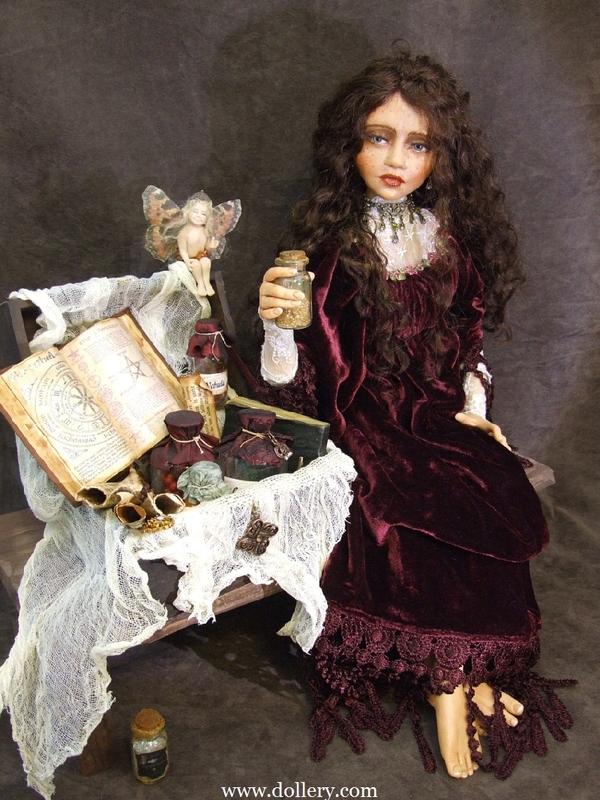 Poison is dressed in a dark burgundy velvet dress with vintage lace. She comes with her chest and the accessories shown. 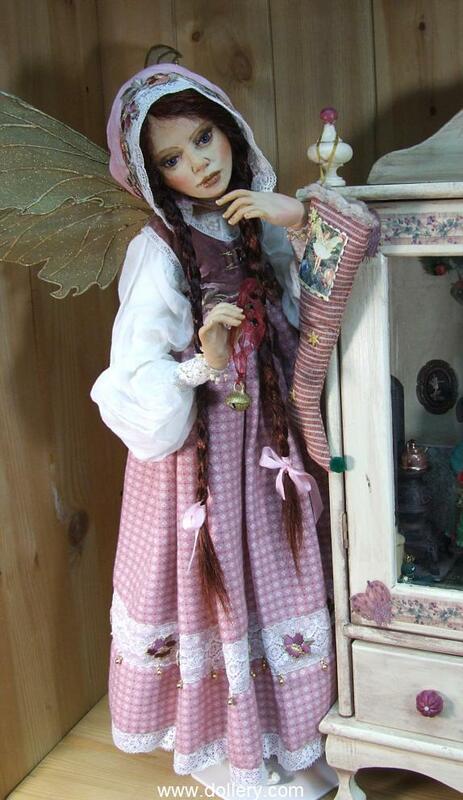 These were created by world famous miniature doll house maker Karin Caspar. the smallf iary is a full body sculpt that measures 3" seated. 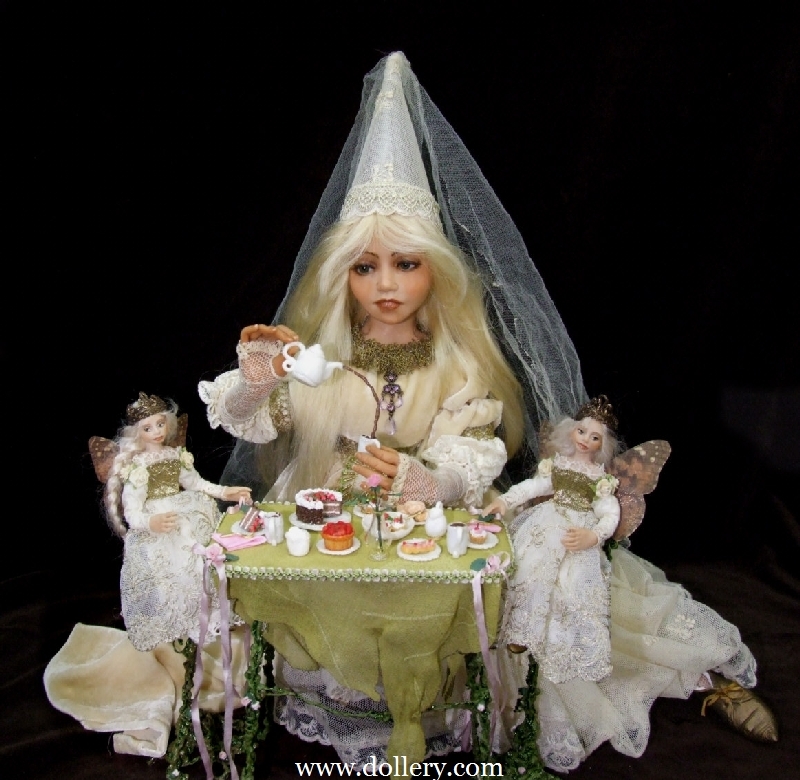 Fairy Tea Party, $5,000.00 SOLD - Contact kmalone@dollery.com about custom "parties" by Silke. The little figures are all 1/12th dollhouse scale, that means the range of sizes are between 3" for the kids up to 5.5" for the adults. 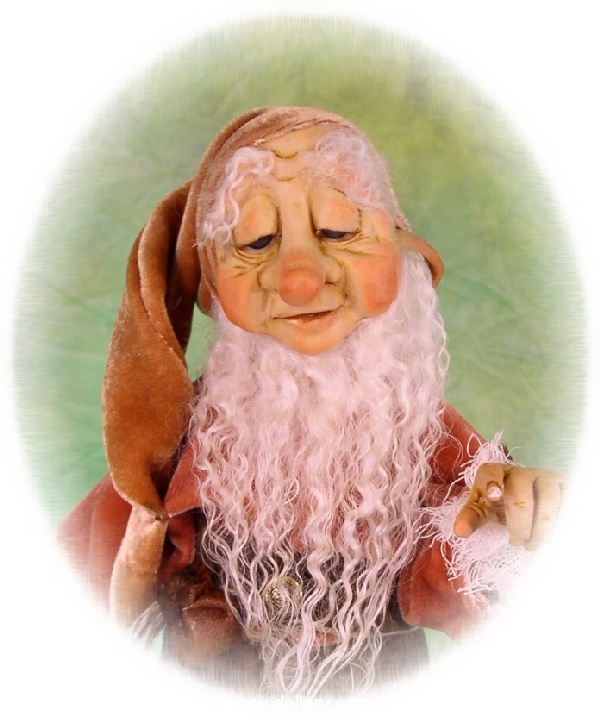 All figures are original handsculpted one-of-a-kinds and posable They are dressed in fine silk velvet and vintage lace, all hand dyed by the artist. 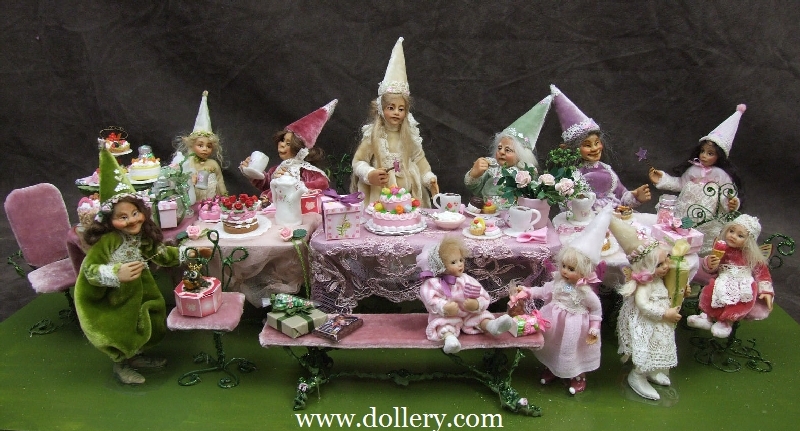 The furniture, the china , the little toad prince and most accessories are also made by this very talented artist. 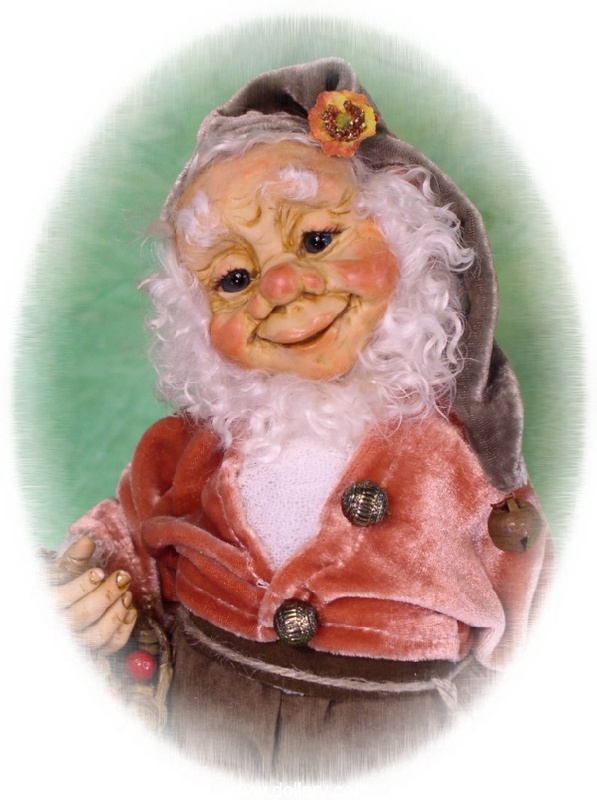 One of a kind polymer clay with stuffed body and wire armature, fully poseable. Green/blue glass eyes, blonde human hair. 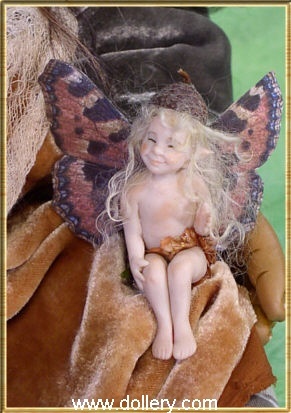 Large fairy is 23" and small fairies are 5.5". It includes the table, chair, china & accessories. 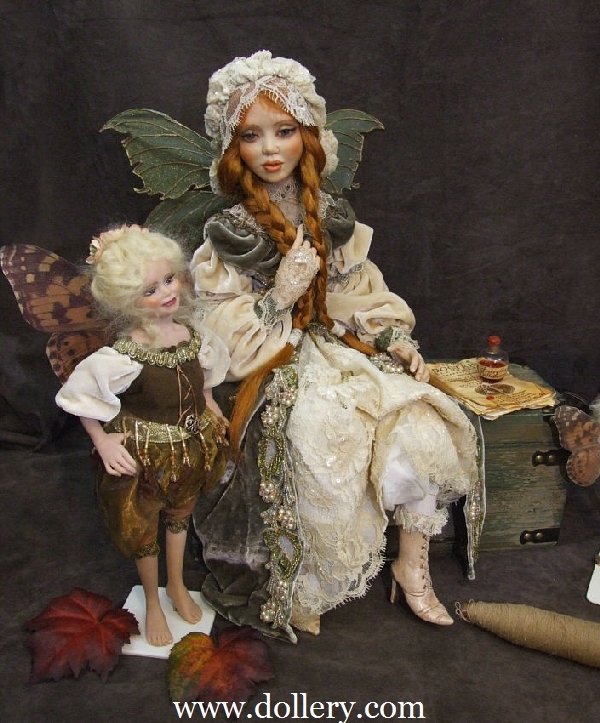 The large fairy is dressed in vintage lace, gold brocade and silk velvet. 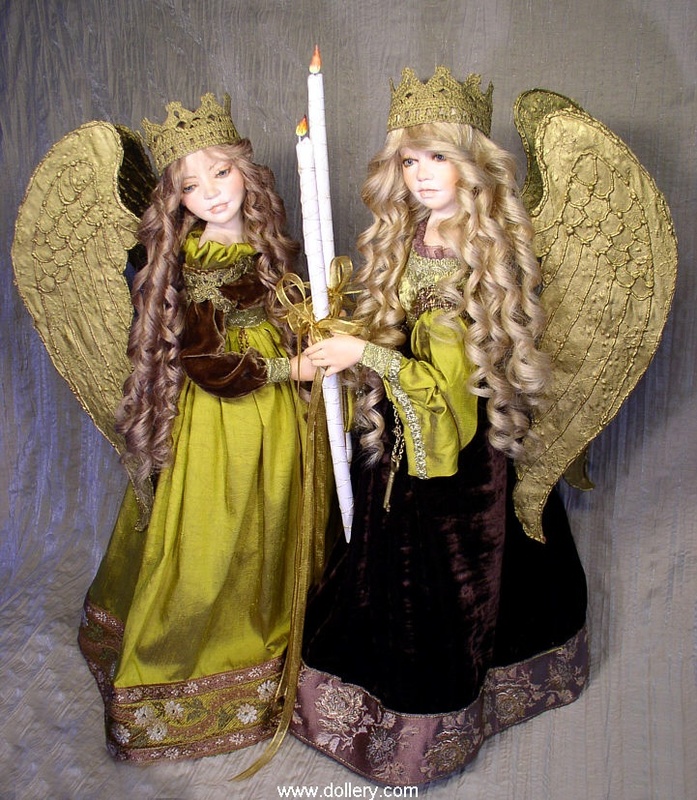 The little fairies are dressed in gold embroidered lace with mohair wigs and painted eyes. The table and chair were made by Silke. 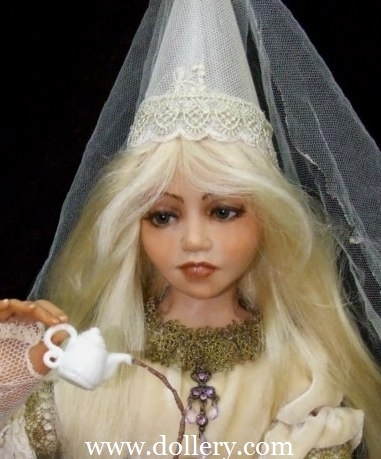 Karin Caspar, famous miniature doll house maker, made the miniature china and the flowing effect of the teapot. The cupboard was built and painted by hand many years ago by an old German carpenter but Silke can't remember his name. It is a unique piece and handmade and measures about 24". 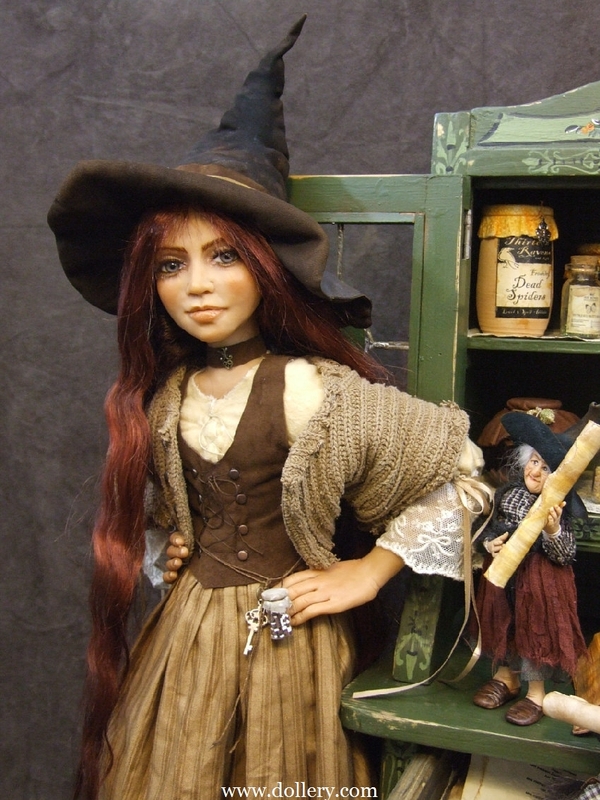 The big witch is about 23" ( without hat), the little witches are up to 5.5". All are posable. See something you like but it is sold? Consider doing a Custom Order. Each is a one of a kind but similar themes or looks can be achieved. Different hair, eye and costume colors of your choice! You can even request different amounts of characters in your display. 25% down and then you can either make monthly payments or pay the balance when the piece comes in. You can even request pieces to come in into 2011. 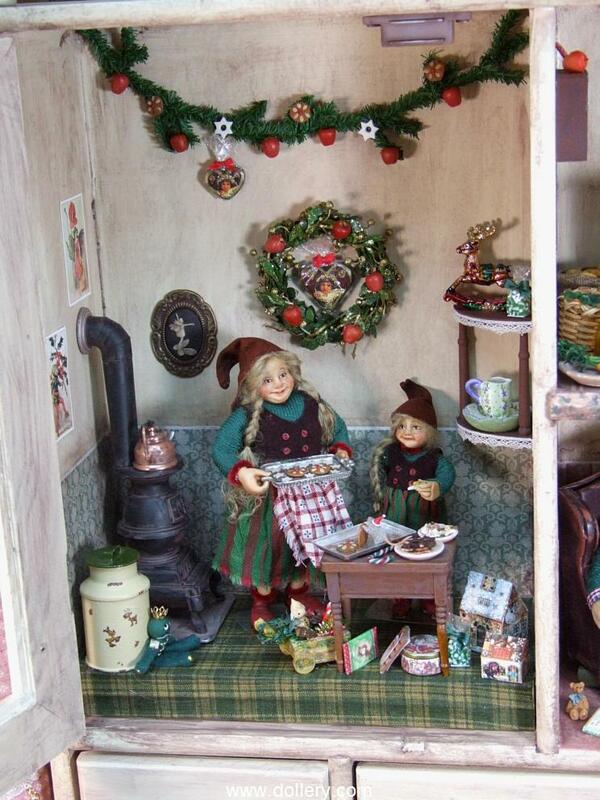 Silke is extremely busy with her 1/12 scale doll house size miniatures so there is a wait time for the bigger dolls. Get in the queue for her pieces now! Silke Schloesser has been a professional artist since 1992. In 1998 she first introduced her work in the USA. She is also well known in Europe and Russia. 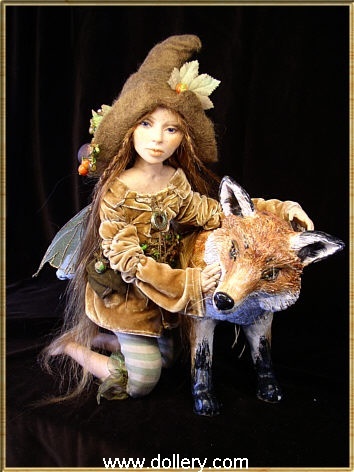 She has a vivid imagination which allows her to create very unique creatures. 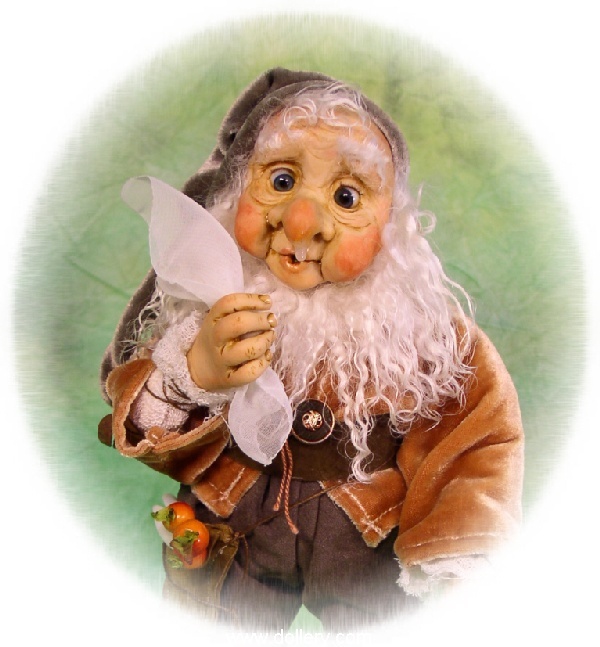 Fairies, trolls, gnomes, pixies, elves, leprechauns, troll bears, witches, storybook characters and more are among the fantastic fantasies you will find by this talented German artist. Many articles and cover stories have been written about her work. 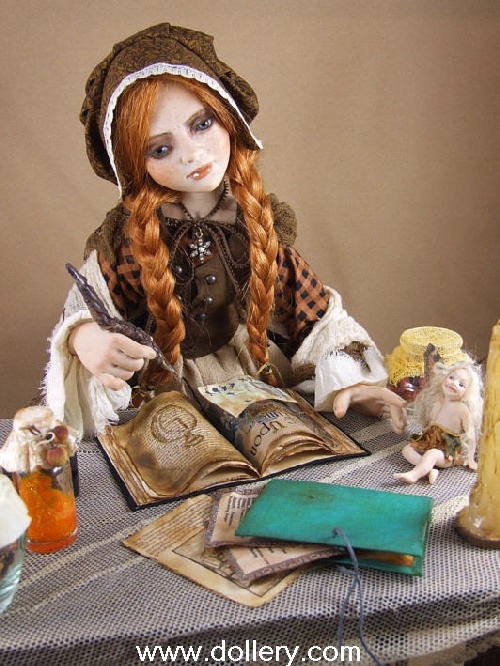 Her full sized dolls are made of polymer clay with stuffed body and wire armature. 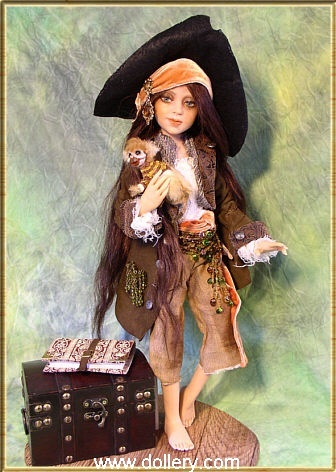 They are fully poseable and usually range in size from 15” to 24”. 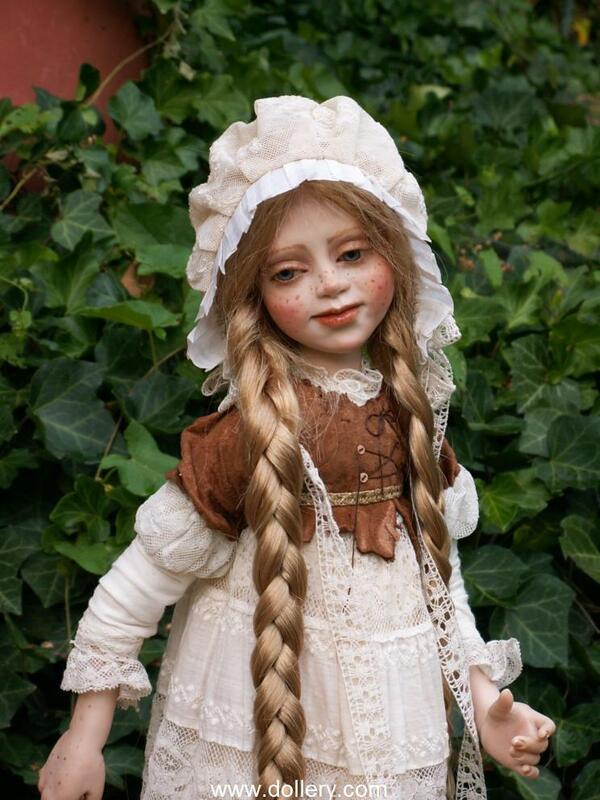 She uses German glass eyes and human hair or mohair. 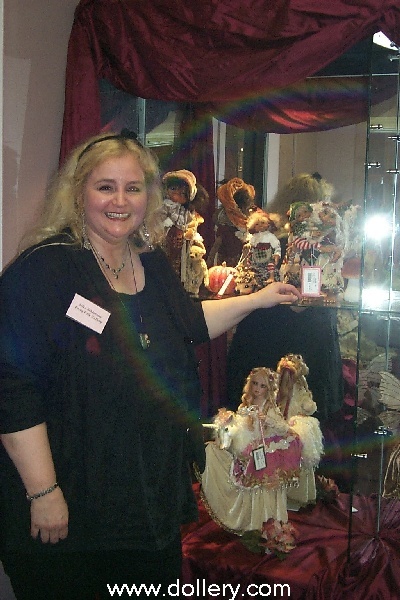 She dresses the dolls in amazing hand dyed silk velvets, vintage laces and brocades, hand embroidered silks, fine cotton and even leather. She makes a lot of the creative little accessories herself. 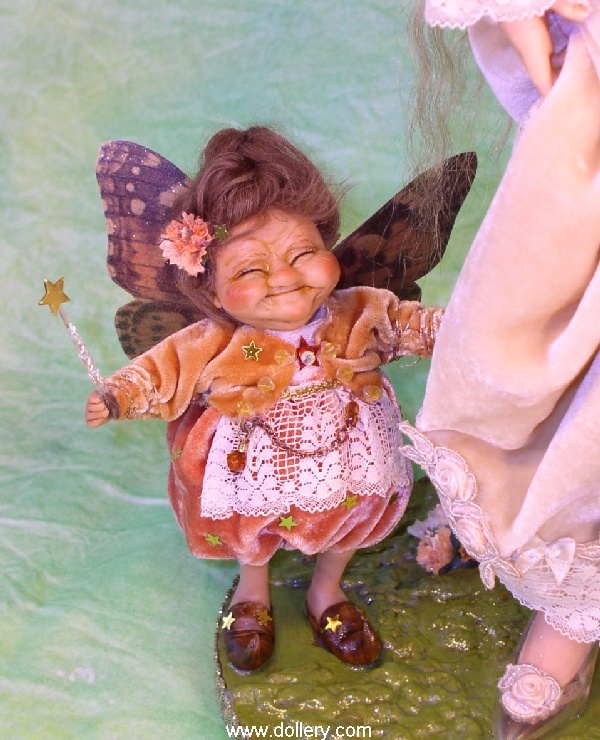 The smaller fairies and dolls that accompany the larger ones have the same attention to detail. 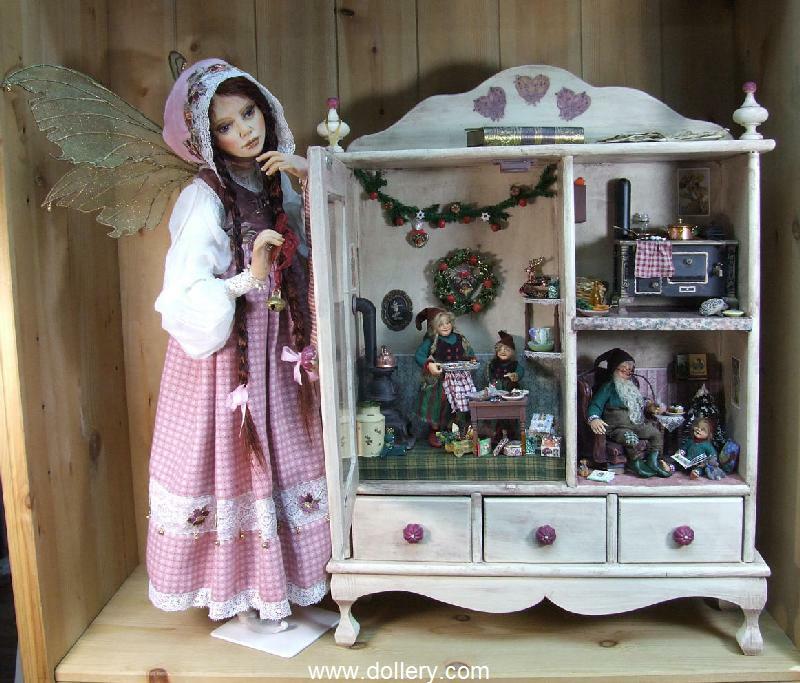 Silke’s latest passion is 1/12 scale doll house miniature pieces. These are usually around 2.5” – 7” pieces. The faces are about the size of a thumbnail. The little tables & desks filled with accessories for these pieces are usually made by her friend Karin Caspar. One of a Kind, 20". 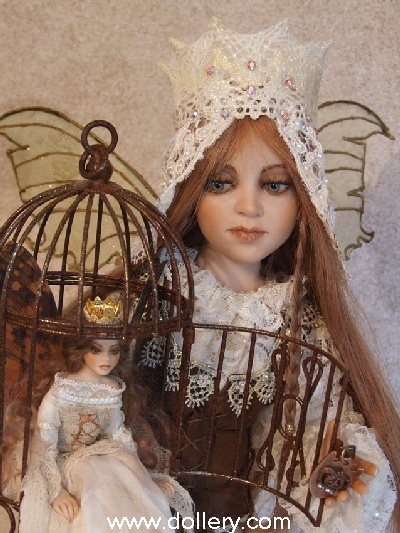 The little fairy in cage is the 1/12 miniature size of 5.5". 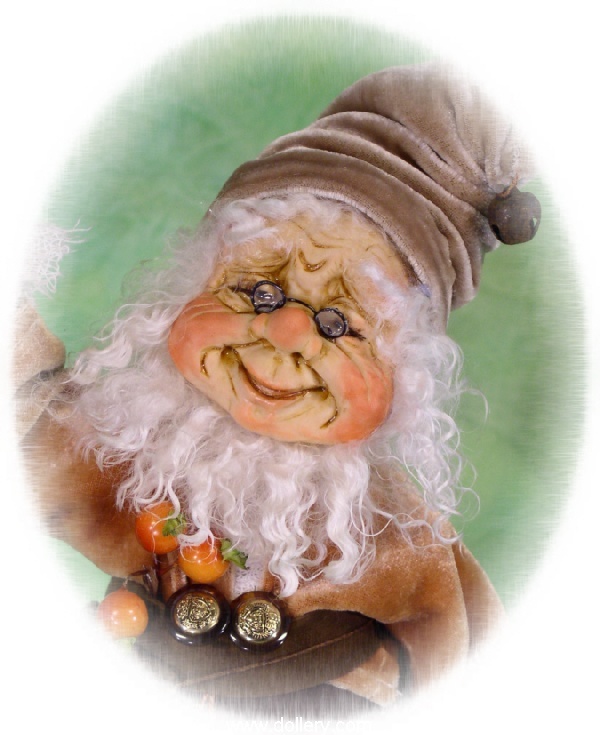 Sculpted from Polymer Clay. 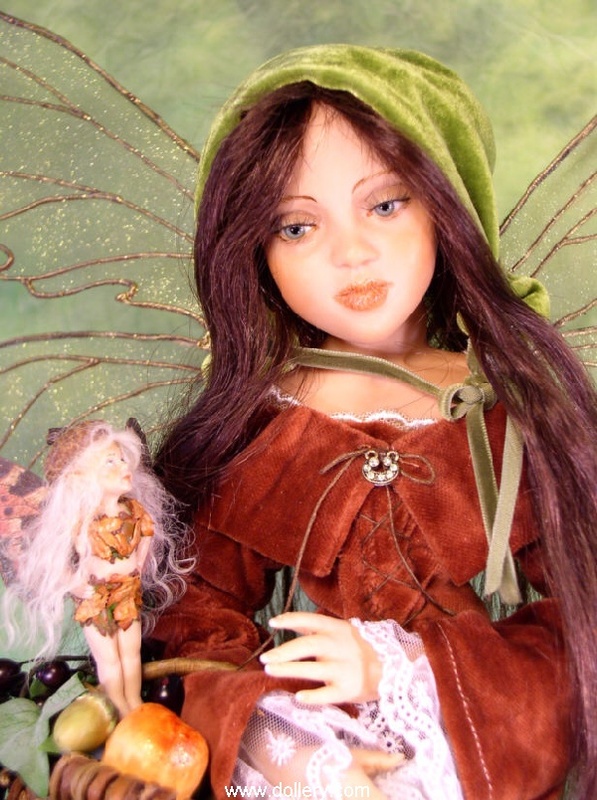 The Fairy Queen has green glass eyes and human hair. 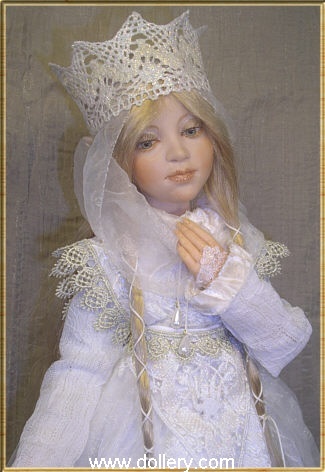 She is dressed in creme colored finest silk embroidered with tiny glass beads. 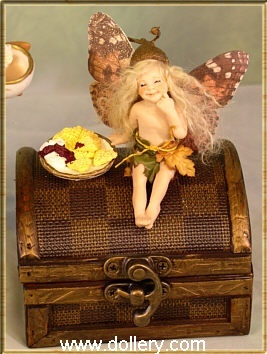 The corset of the doll is from leather, she is a fantasy piece, another royal fairy with wings. 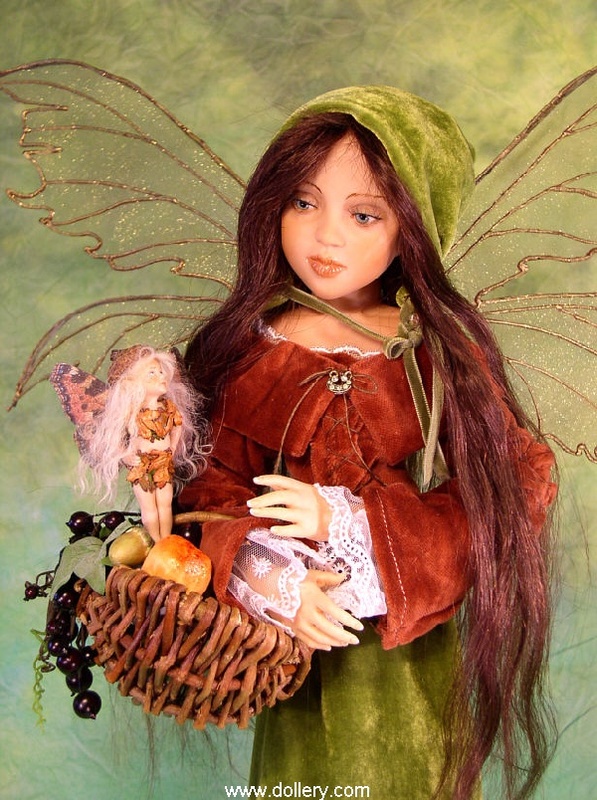 She is letting go a shy little Lady fairy - fully dressed. Orders may be taken for similar sets. 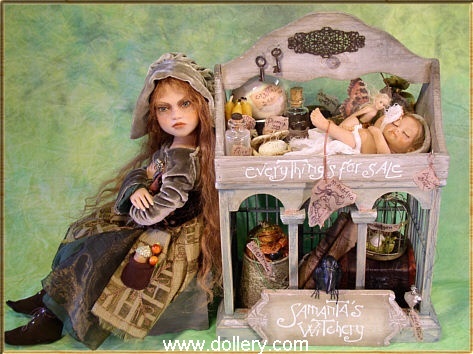 Witch or babies can be bought separately! 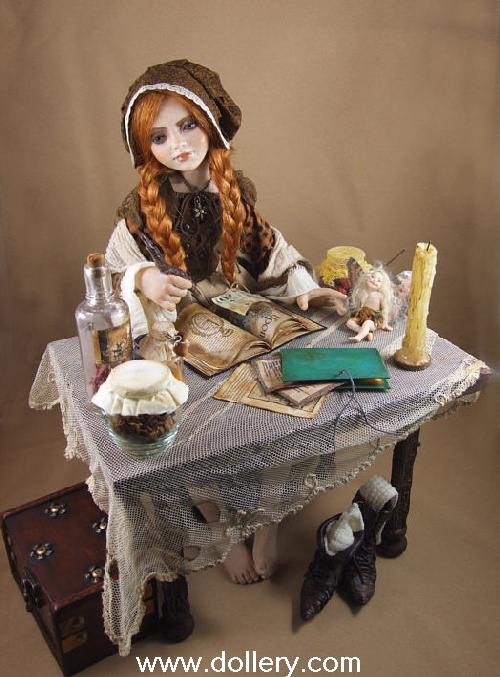 Her body has a posable wire armature like all of Silke's dolls. She has extra long dark brown human hair with a few lighter strands. 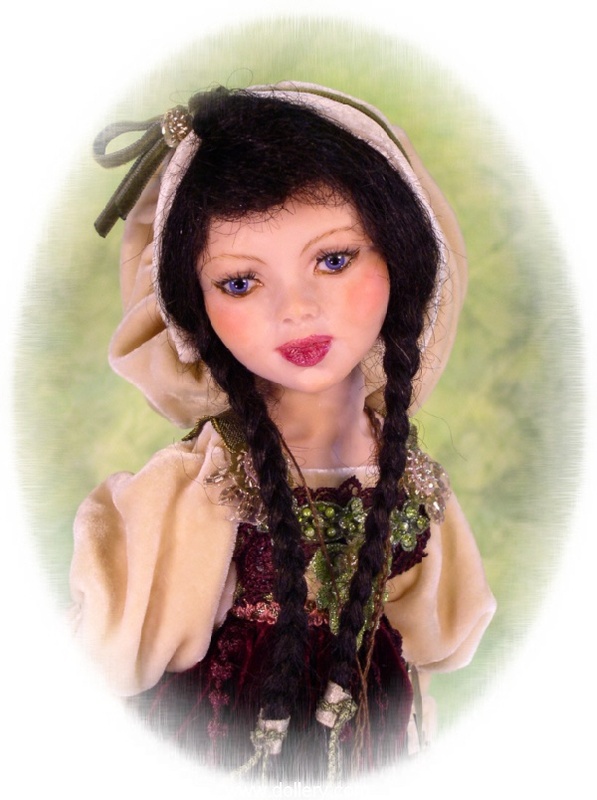 She has blue-green German glass eyes and human hair eyelashes. She wears a satin cord around her neck with a cameo ( white on green). 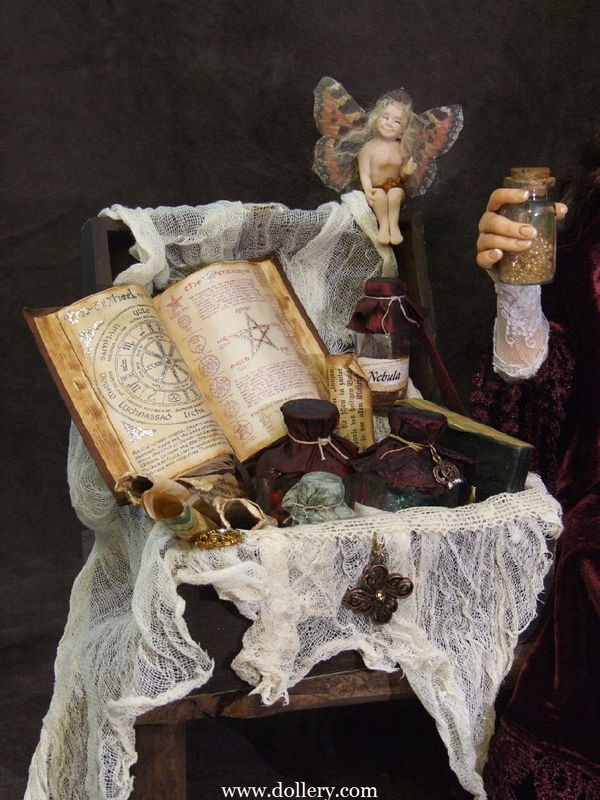 Madame Lundi is doing experimental spells and potions. 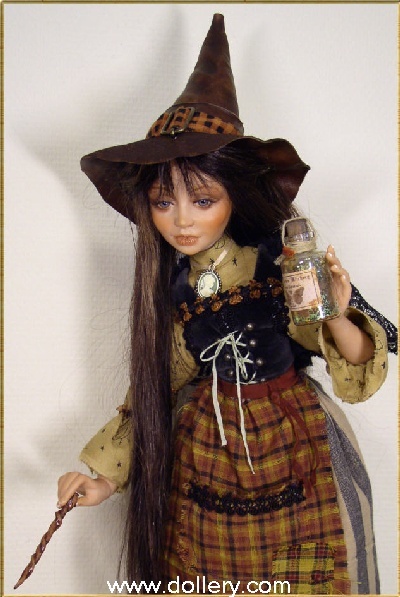 In her hand she holds her magic wand and a bottle with a "flying potion" which includes fairy dust. 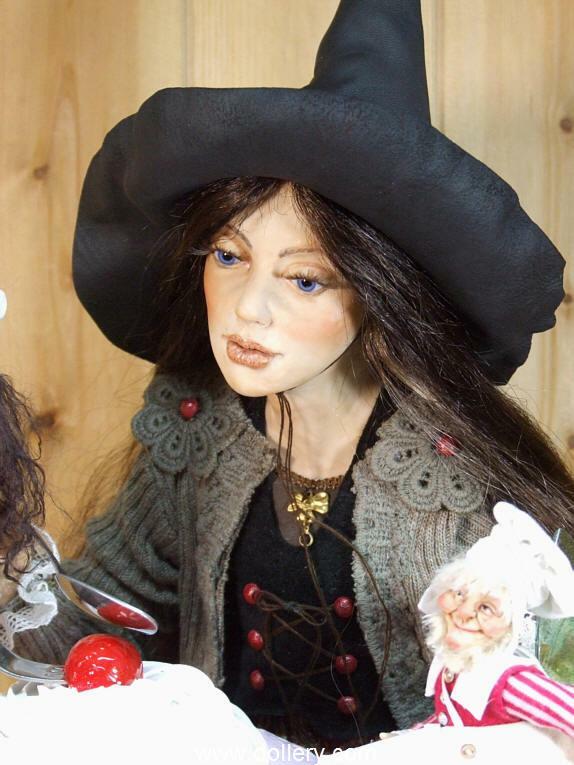 Her shop is called "Olde Birken Witchery." 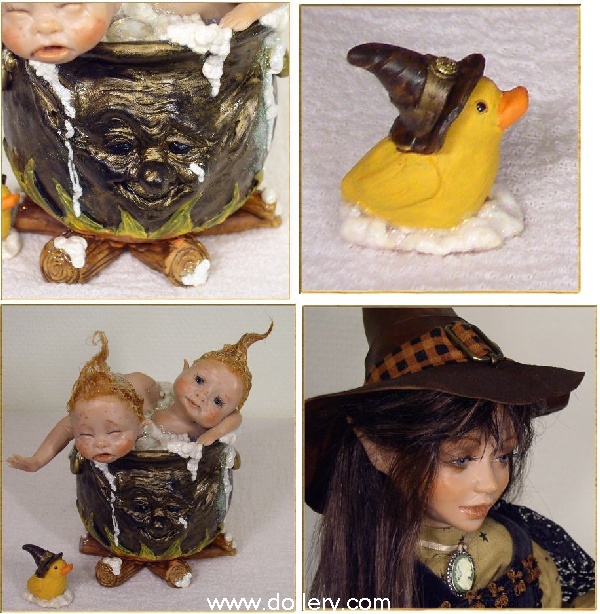 These two twins are Willy and Lilly, it´s bathing time,Willy is the crying one because his little duckie fell down and he can´t reach it. Lilly is just a sweet little Baby girl, thinking her brother is nervy !!! Her Majesty was broken in transit, Sorry. Similar sculpts may be ordered. 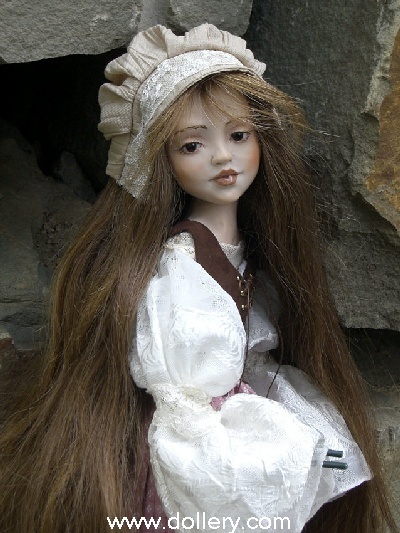 Silke Schloesser came from Germany to be at our 2008 26th Doll Show! 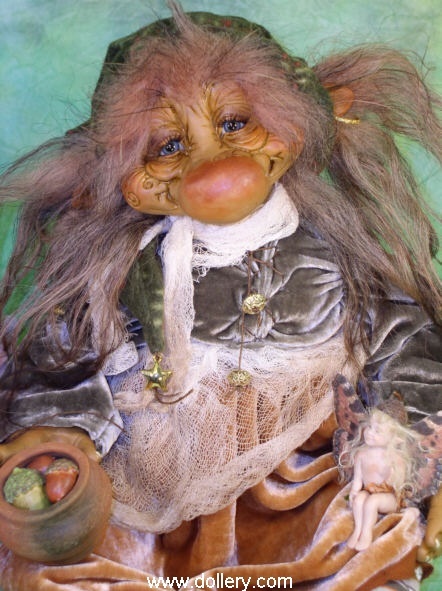 Troll Wife and Fairy Friend, One of a Kind with blue glass German eyes, velvets and fur hair with a nice orange-red touch. 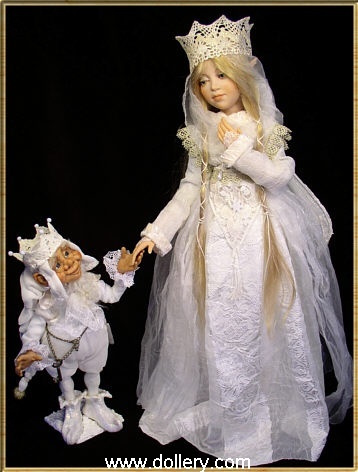 Troll is 19" standing, Fairy friend is 2.5" seated and is fully sculpted, not attached. Selina is dress in hand dyed silk velvet and lace. 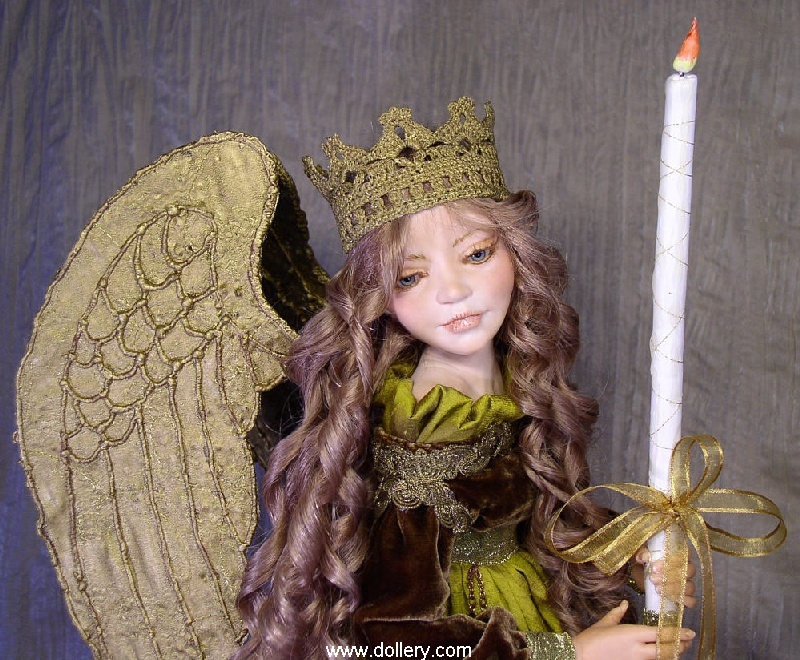 Her head and wings are poseable. 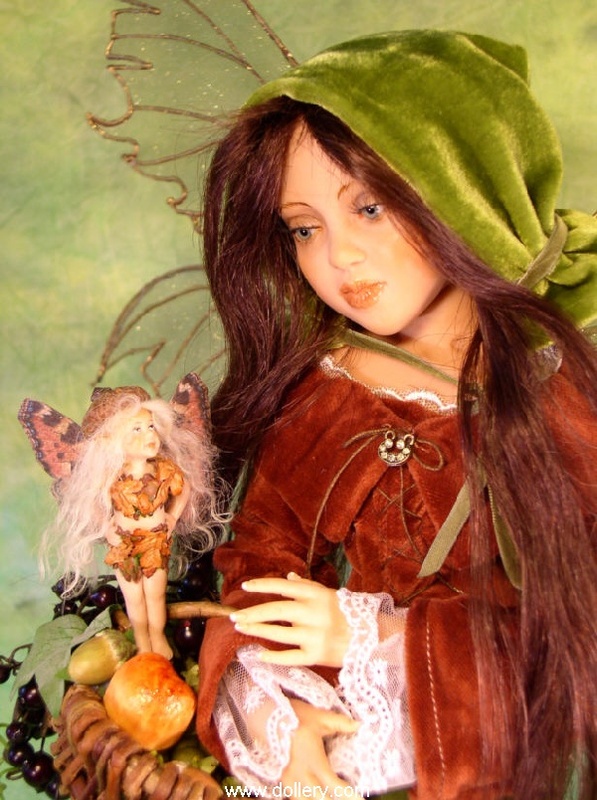 She comes complete with her tiny detachable tiny fairy. 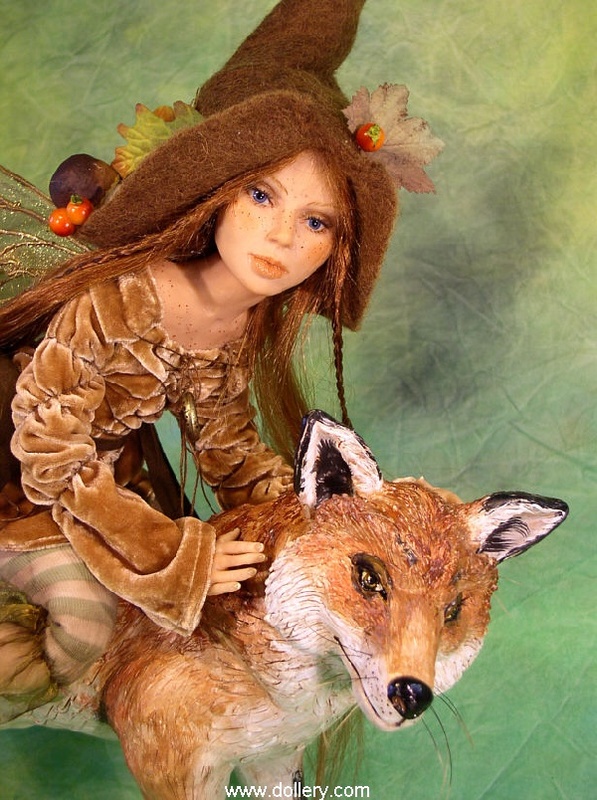 Wildlife Friends includes the fairy and the fully sculpted fox. The fairy is fully poseable. Her head is moveable. 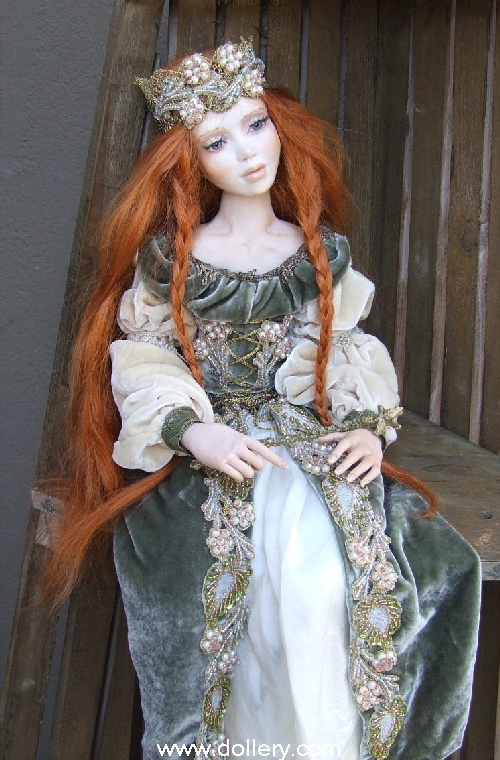 She is dressed in hand dyed silk velvet and leather. 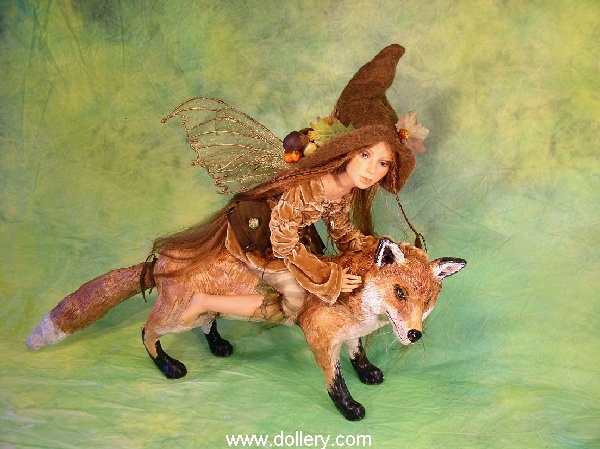 She comes complete with her hand felted hat, detachable wings and hand made fox. 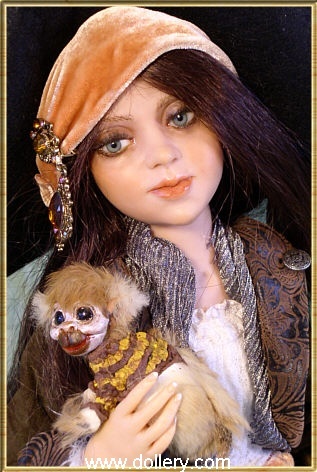 One of a Kind, Blue German glass eyes, human hair, mohair wigs. 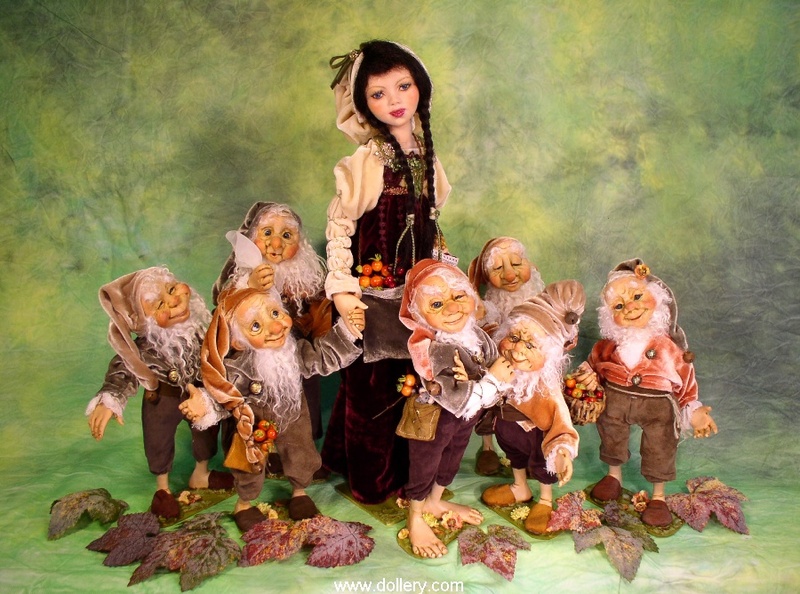 Snow White is 19" and the dwarfs are all between 9" & 12". All are dressed in silk velvets and wash leather. 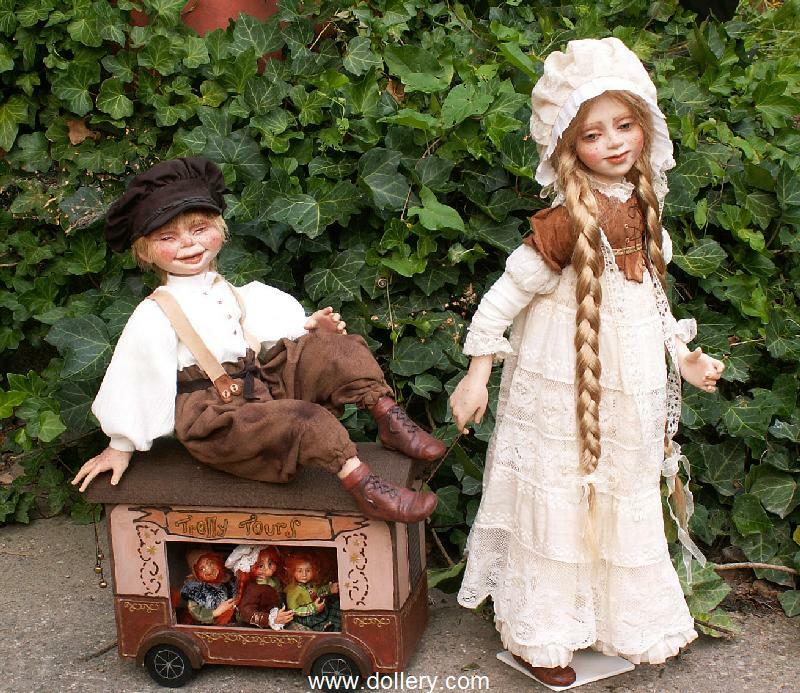 All dolls have poseable arms & heads. 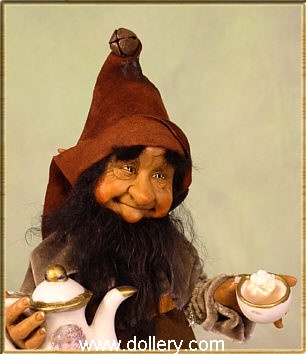 The Dwarfs are fixed to their base. 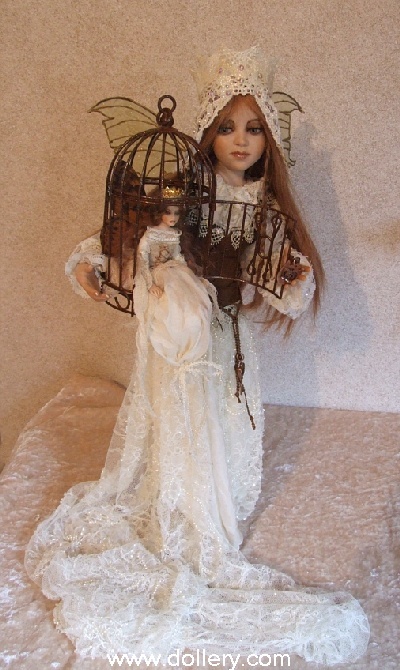 Show White comes with her doll stand and has poseable legs as well. 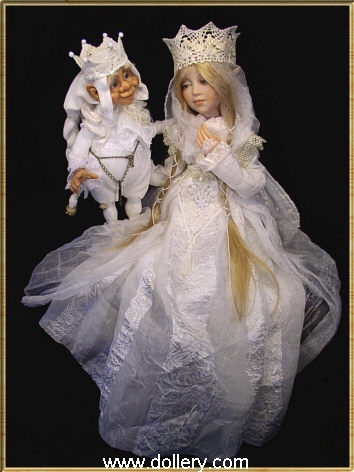 One of a Kind with German Blue glass eyes, blond human hair, 19" and 5.5"
They are both dressed in hand dyed silk velvets with lace and gold brocade. 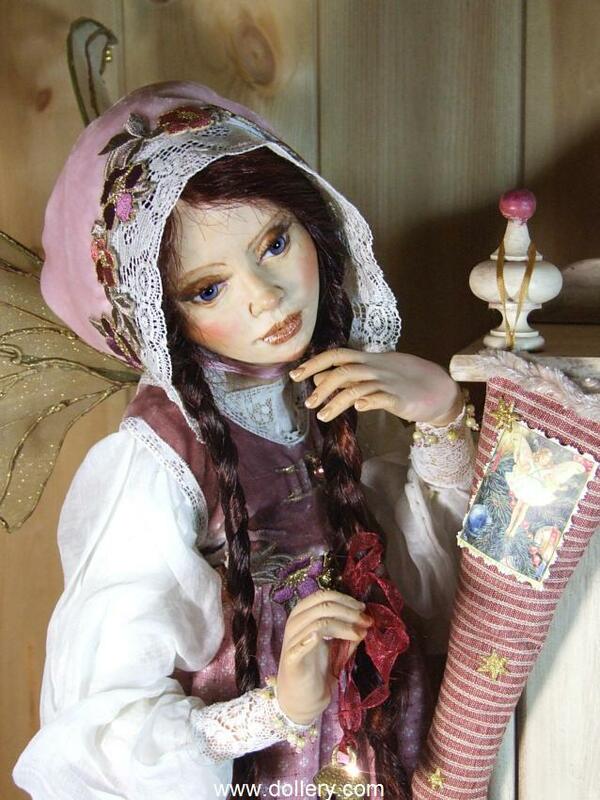 Cinderella is also in embroidered silk. She is wearing a crown with13 Swarovski crystals. Her godmother comes complete with her iridescent shimmering magic wand. 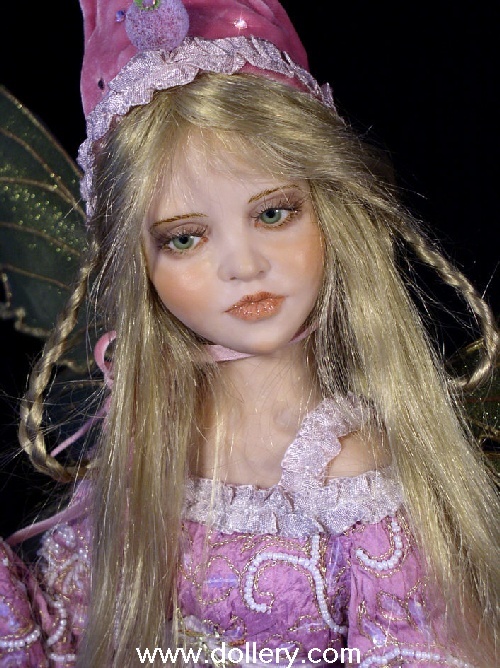 Sugar Plum Fairy, (below), $900 NO LONGER AVAILABLE but similar sculpts may be ordered! 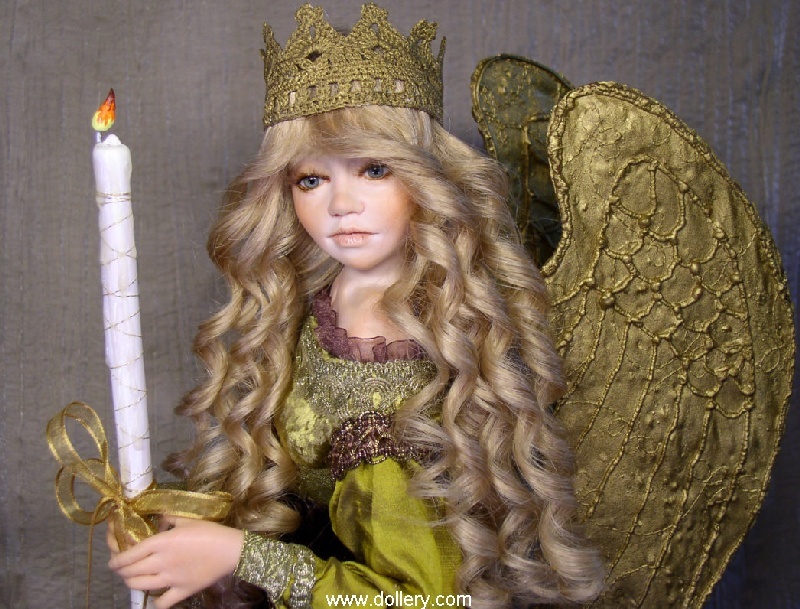 One of a Kind with Masterpiece soft glass blue eyes, blond mohair, 10"
they are dressed in gold brocade, silk velvet, raw silk and have hand made detachable wings, crowns and hand sculpted candles ( no real candles) both are poseable because of wire armatures inside, candles are fixed in one hand, come with doll stand. 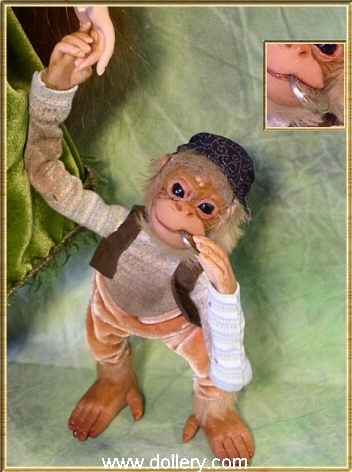 One of a kind, poseable, head is extra poseable, wire armature inside, 21"
stands, comes with little monkey, treasure box and book. Real female Pirate of the Carribean from the past. 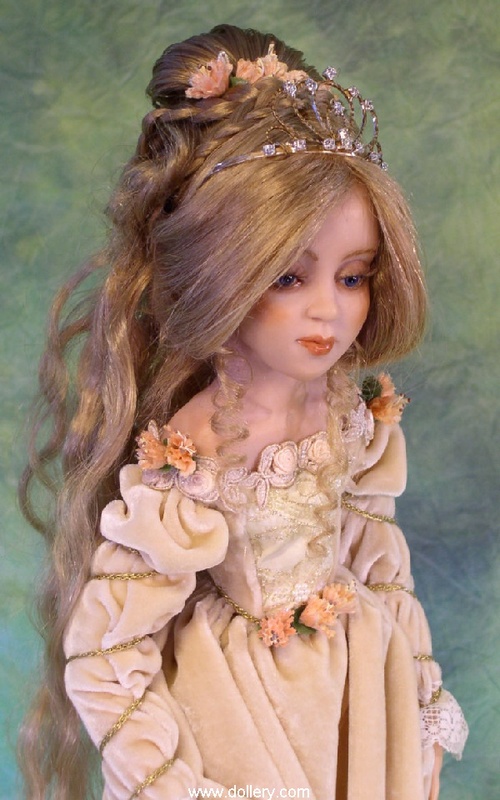 She is dressed in hand dyed silk velvets, leather and lace. German glass eyes, brown human hair. 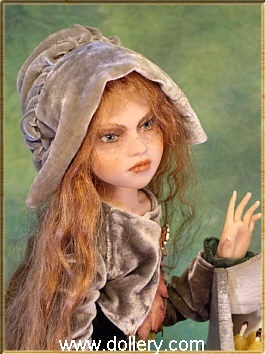 Grace O'Malley, $3,200 Inquire on availability. 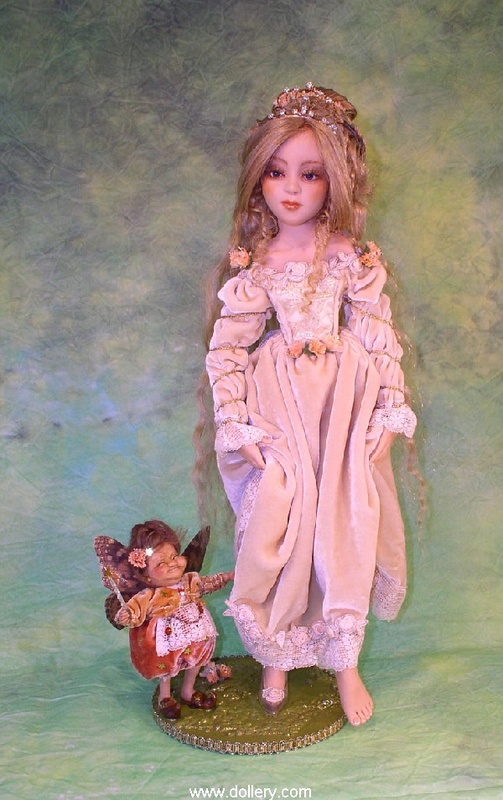 Original One of a kind, poseable, head is extra poseable, wire armature inside, 23"
stands, comes with little monkey, treasure box, hat, and dress all done by Silke. 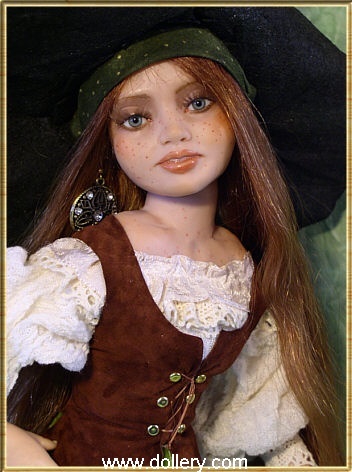 Historic female pirate of the Carribean from the past. She is dressed in hand dyed silk velvets, leather and lace. German glass eyes, brown human hair. Samantha is upset, she´s angry, almost every day she has to take care of her little baby brother. He is to young to play with, he´s sleeping all the time, except he is eating or get´s new pampers because of tooo much pooo or peee, while her mom is in her magical Witchery store selling great stuff to real witches. 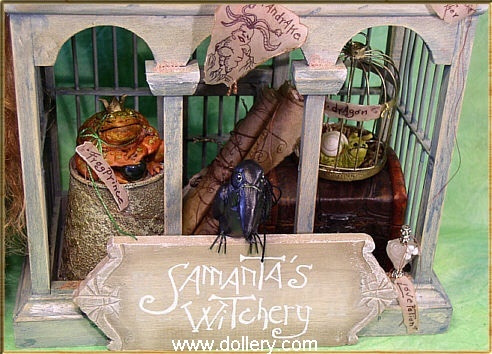 This is why Samantha had the idea to create a little store by herself and sell great witchery stuff to the folks at the Goblin market , okay she hasn´t the experience like her mother and not the right goodies (and isn't a very good speller).... but Sam´s very clever and so she´s trying to sell some interesting self made stuff which she finds very similar to her mom´s magical things in her Witchery....and her baby brother! 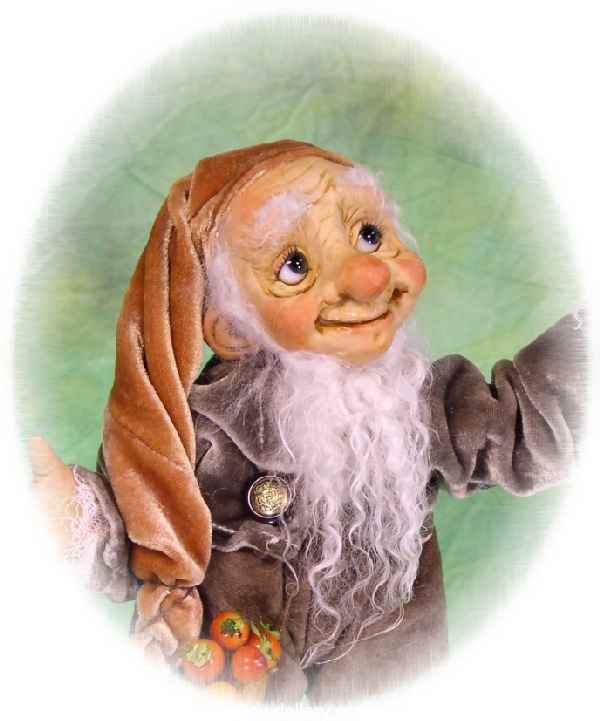 She had the clever idea to offer him as a famous magical root, the mandrake. 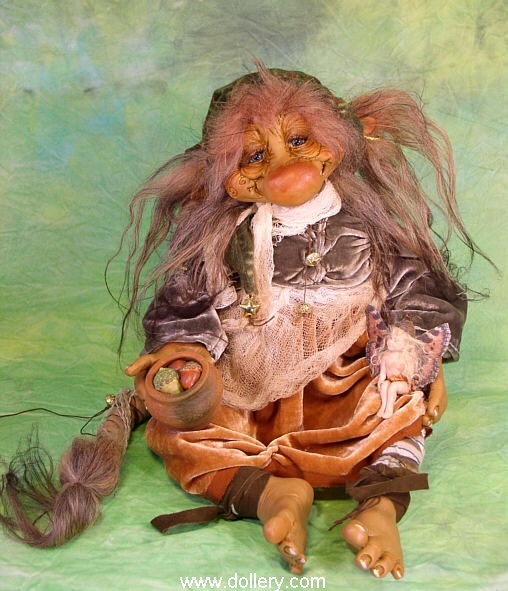 Samantha measures about 18", she is posable, has a wire armature inside, head is extra posable, dressed in hand dyed silk velvets ,human hair, green German glass eyes, added eyelashes, her wooden store can be opened, her baby brother "the Alraune/ Mandrake or Mandragora" (a magical plant which roots do look like a wrinkled ugly baby) is fully sculpted and measures about 5,5", the tiny fairy beside him is also full sculpted and about 4". This little store is done in collaboration with my son Marius Schloesser (an art student) he did all the drawings I needed, inclusive the "old" paper rolls with sketches on the fakes: "Frogprince," "crow," "green dragon," "Love potion," "Leprechaun´s pot of gold" etc are all hand sculpted by the artist. Sales stand measures about 13". 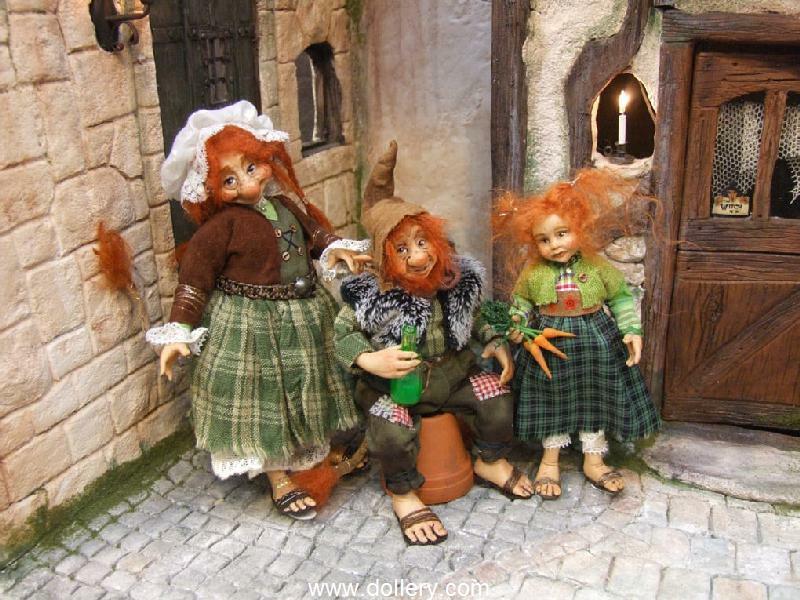 Samantha is 19" standing, baby brother is about 6" and fairy is 3.5"
Here´s what she is trying to get rid off and make some money with...but be careful, all goodies might have magical powers you don´t know about !!!! Find out what might work for you, but please don´t forget that this teenage witch is still studying witchcraft and gives no guarantee of authenticity. There is a "seeing" Crystal ball, "St. Elmos fire lights", a "Phoenix" egg, "Fairy dust," an itzy bitzy spider, "Leprechaun gold," a sack full of Lavendula blossoms, a "real frog prince", a green "dragon in a golden cage", a bottle of "love potion", a "talking crow," some old scrolls showing "spells or potion recipies," two magic keys and a very big mandrake root. 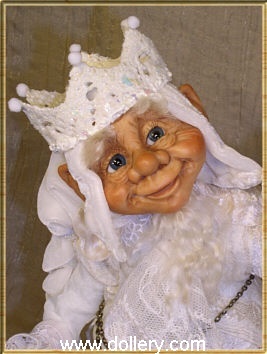 The Winter Fairy measures about 20", the little Gnome King is about 8,5"